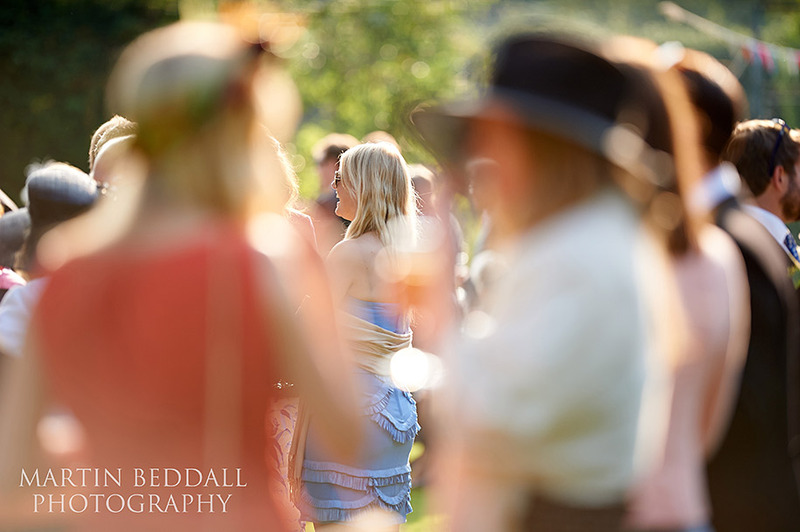 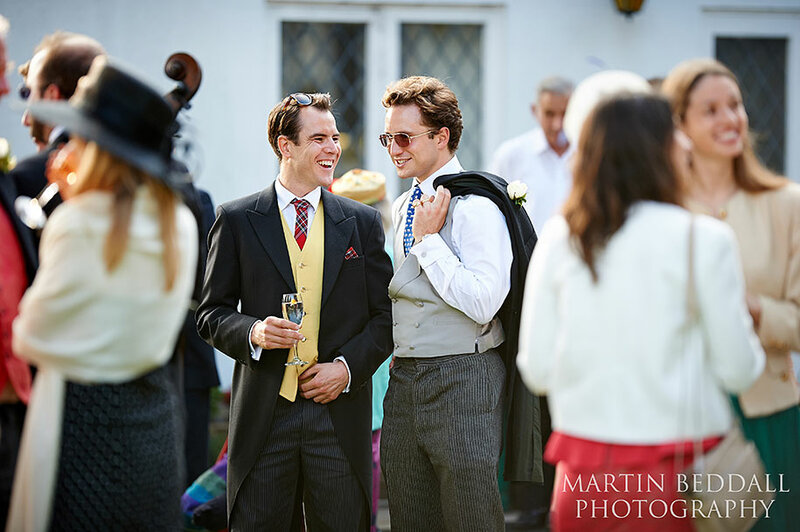 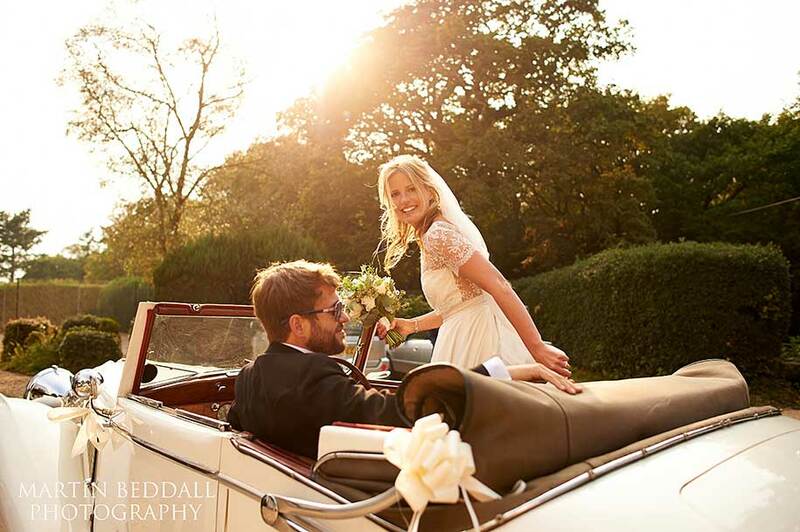 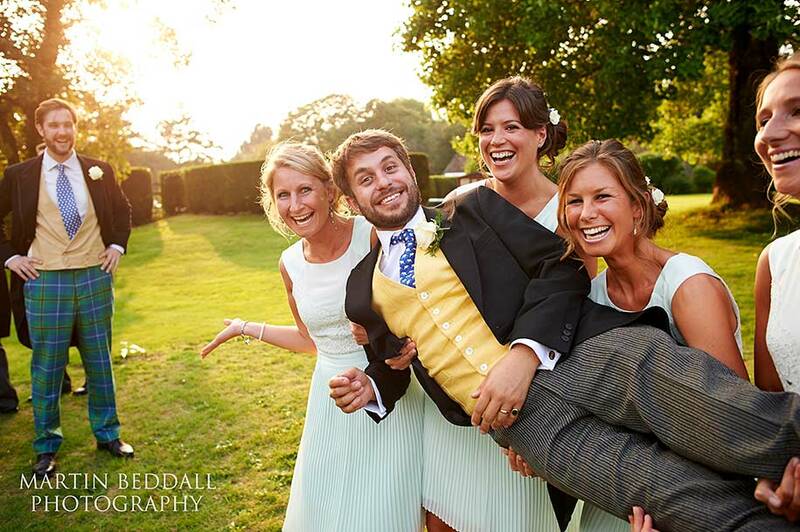 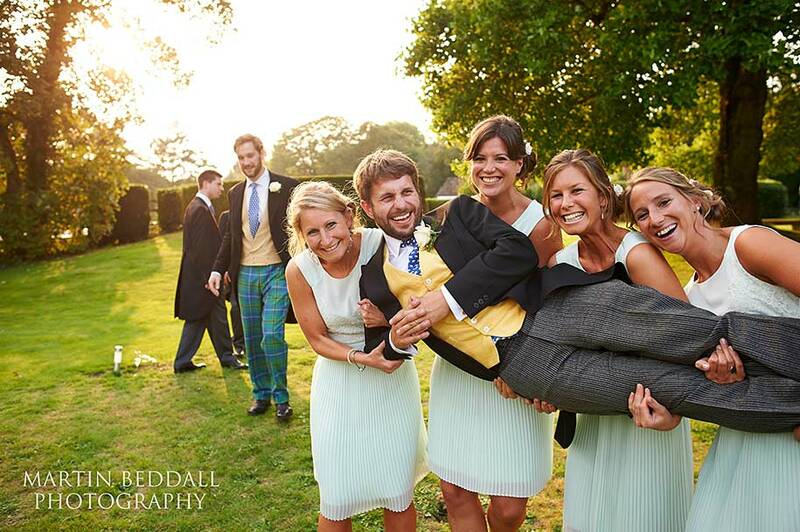 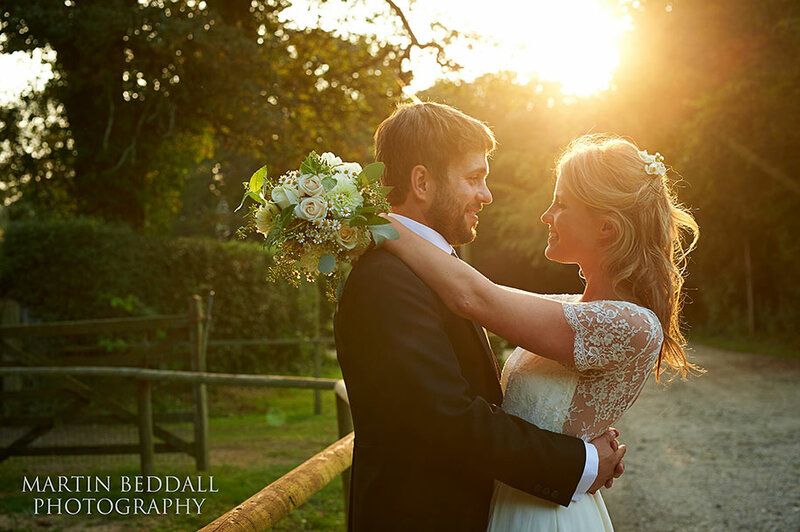 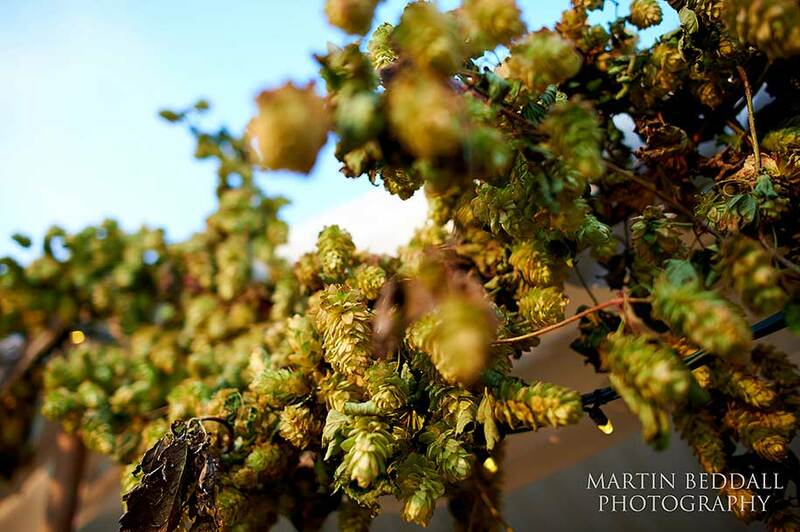 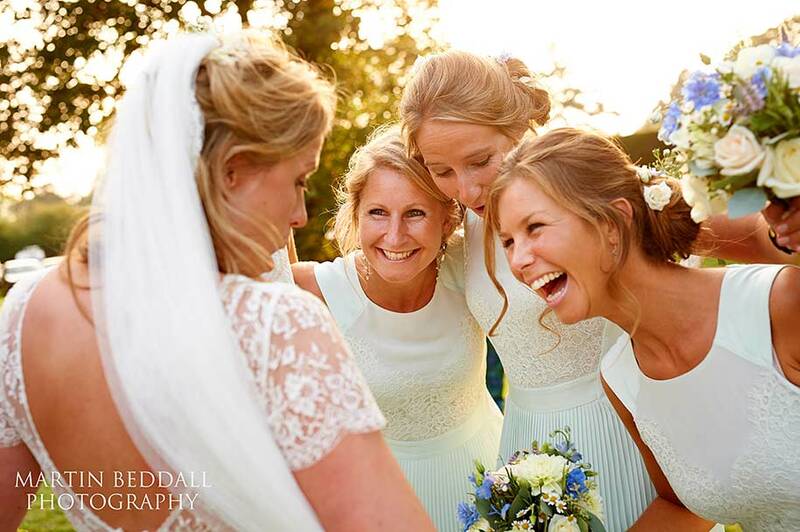 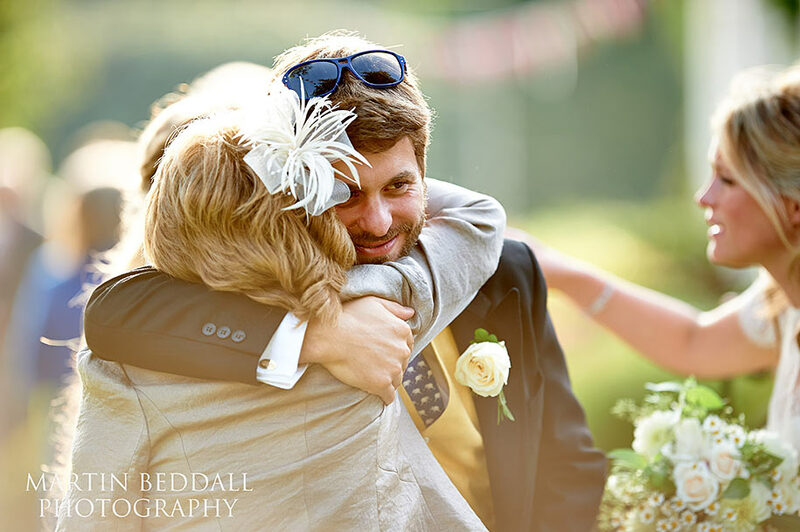 New Forest wedding for Claire and Robin in the sunshine. 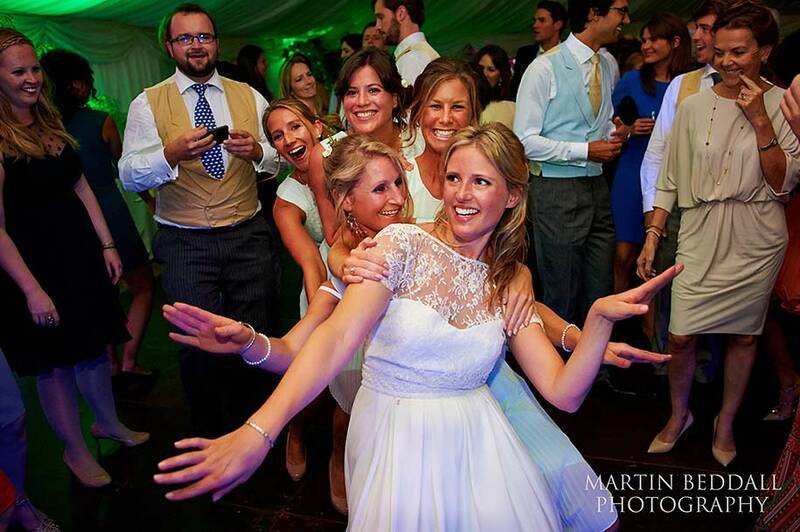 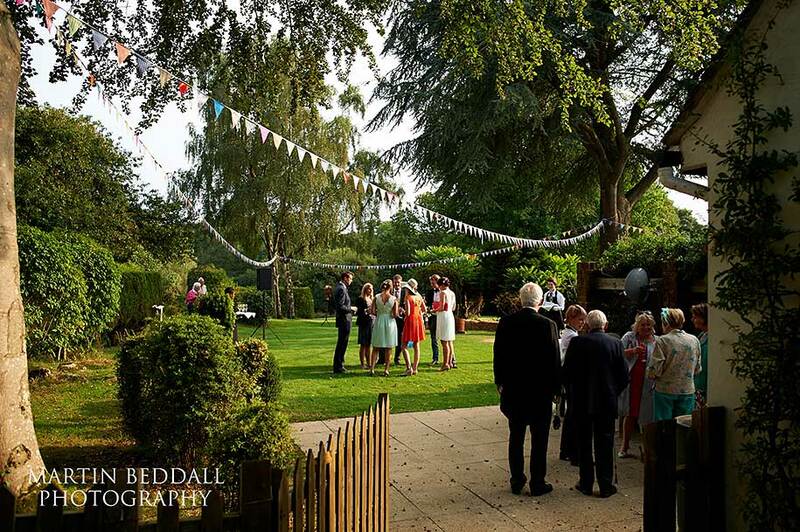 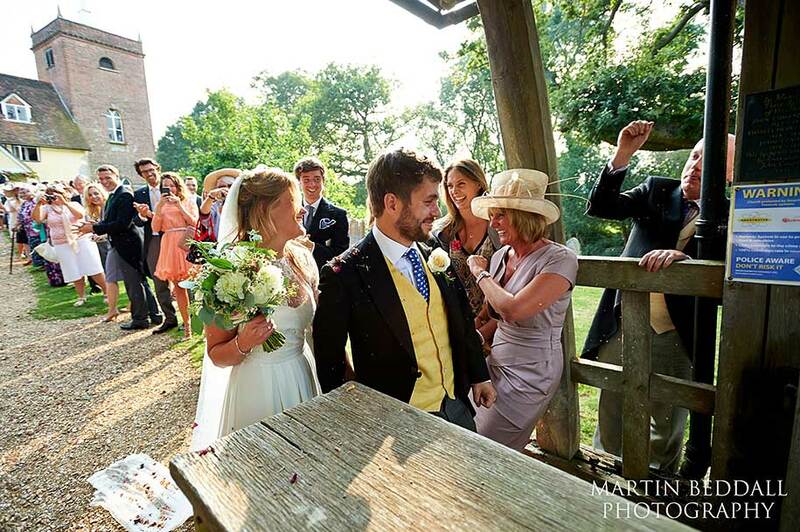 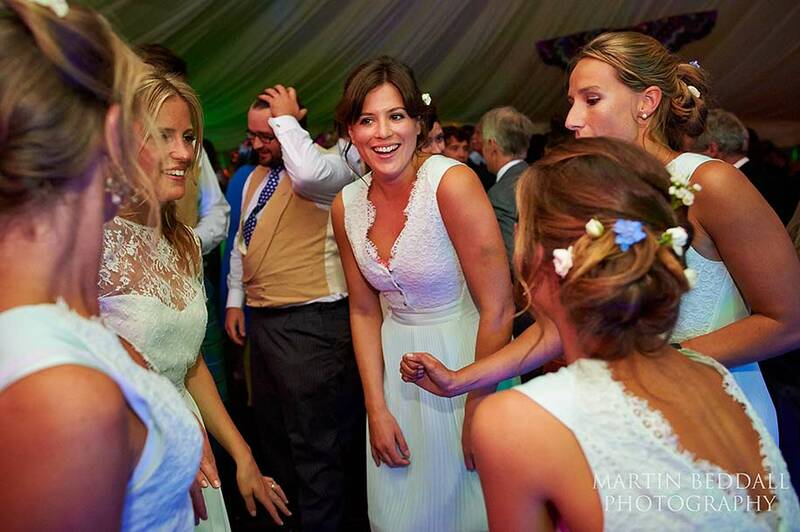 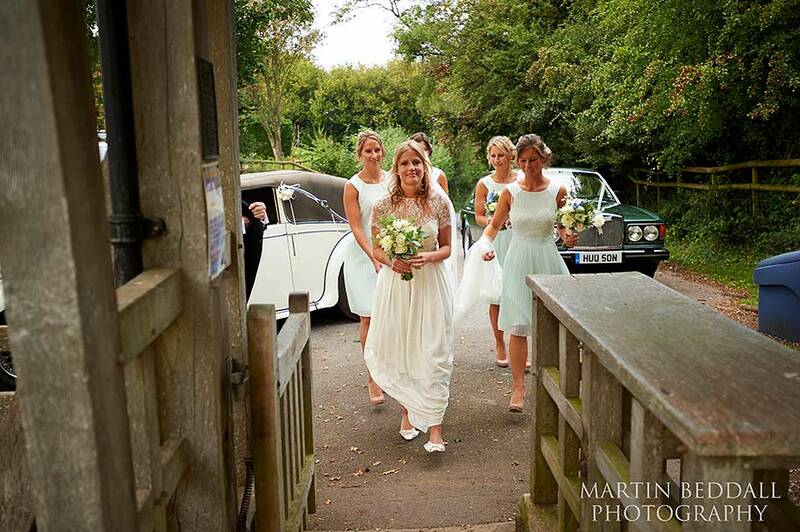 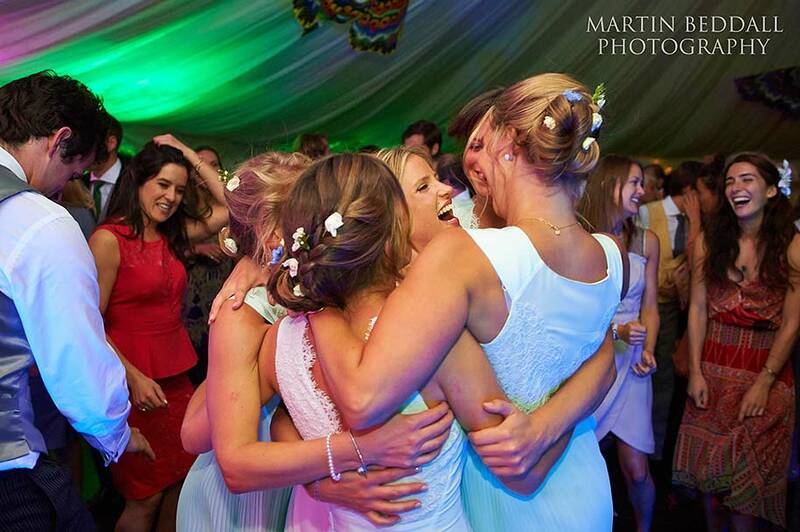 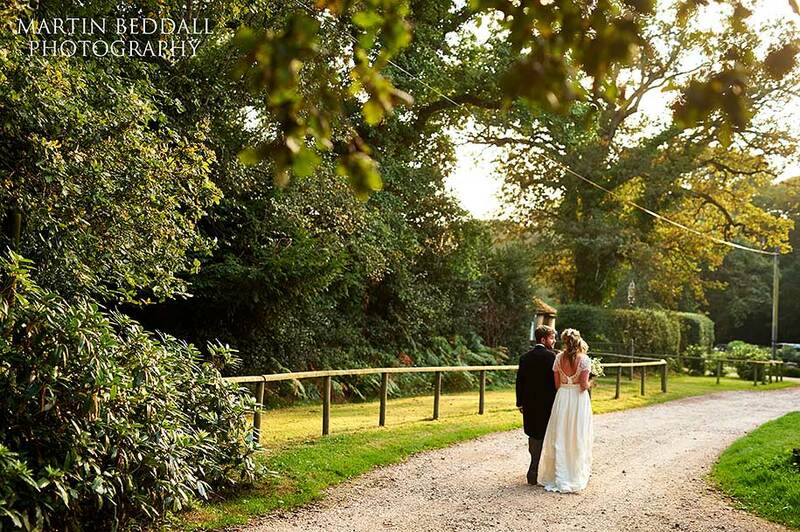 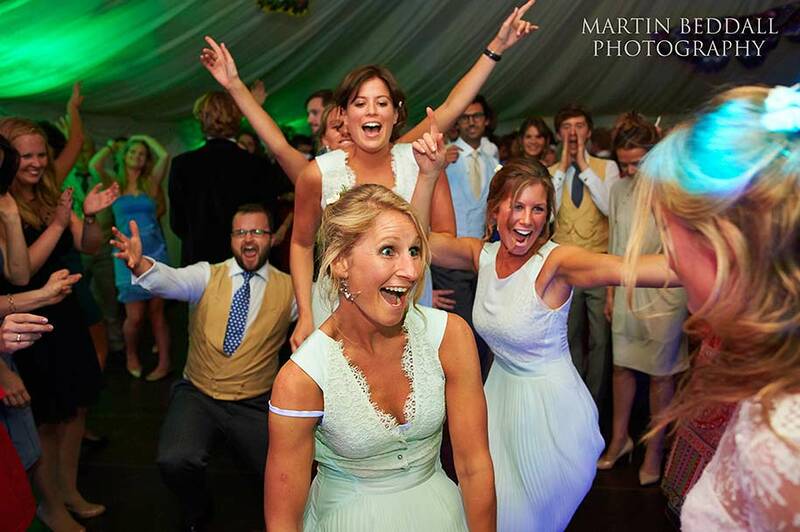 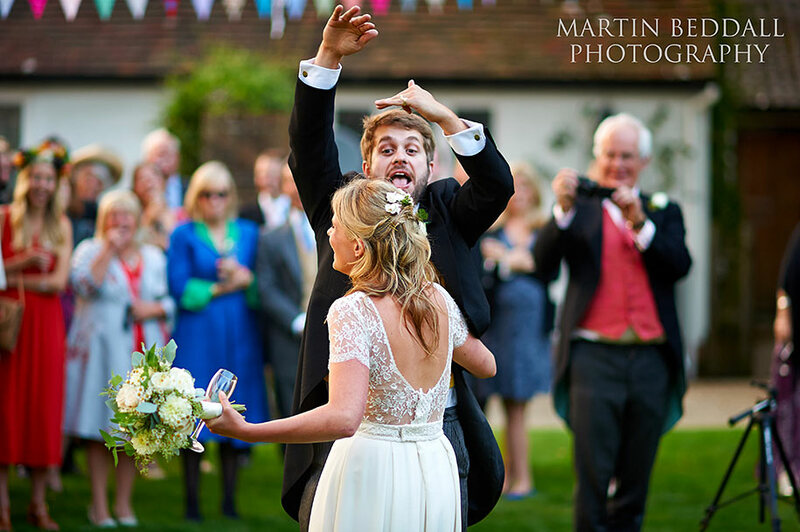 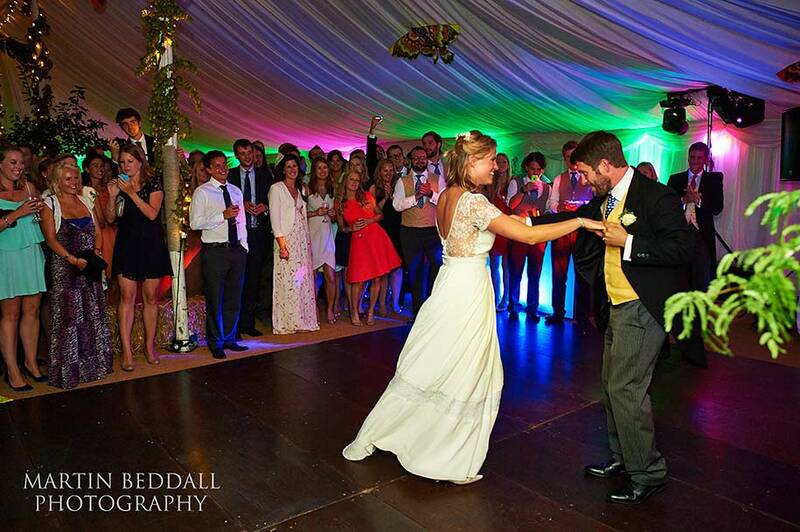 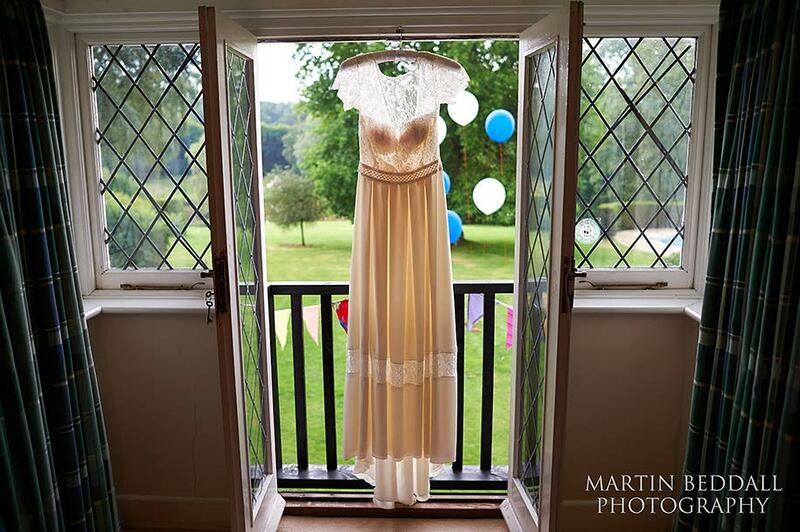 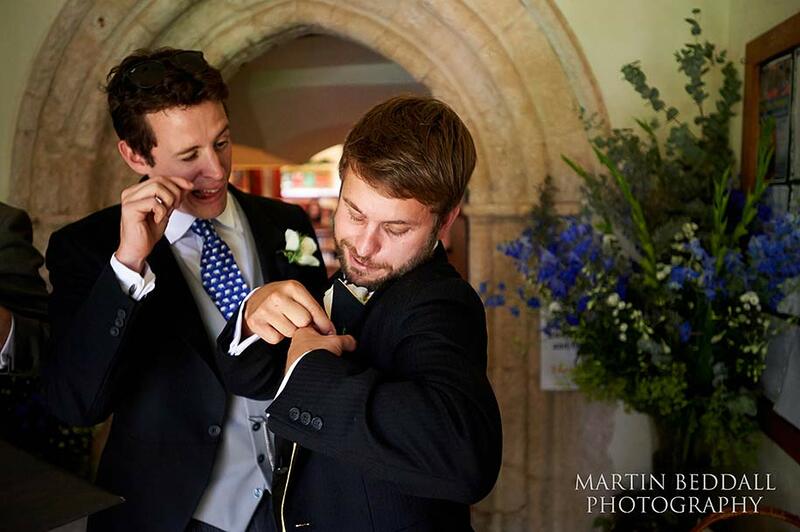 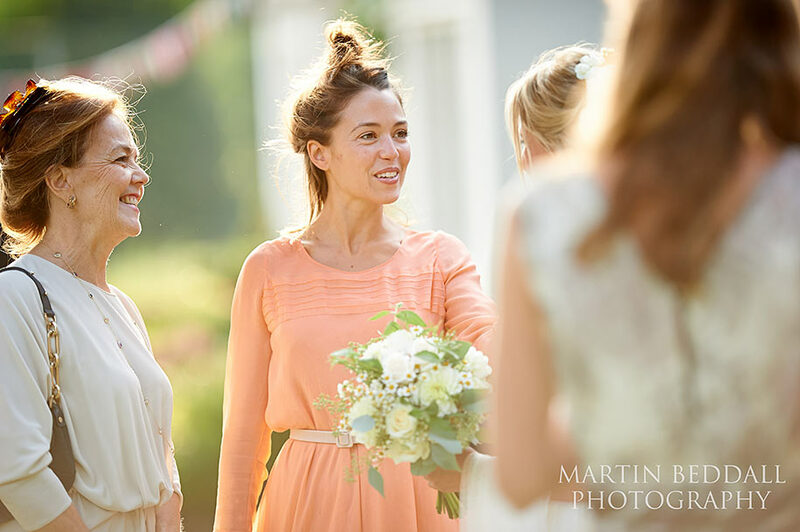 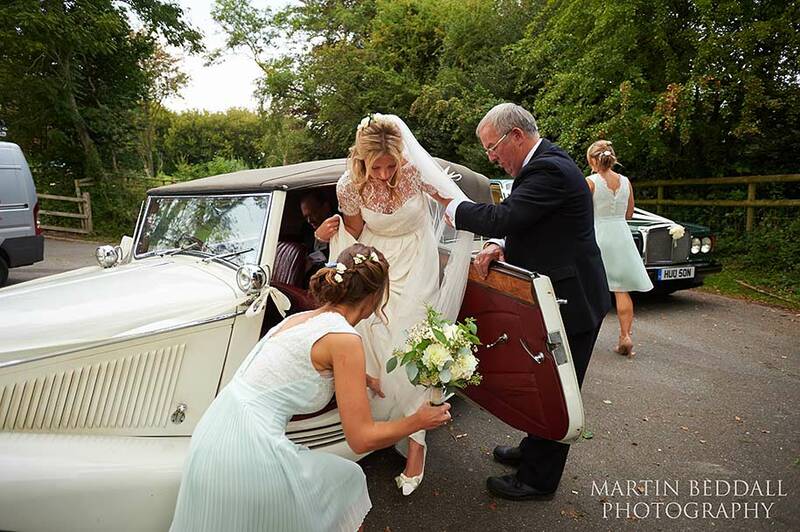 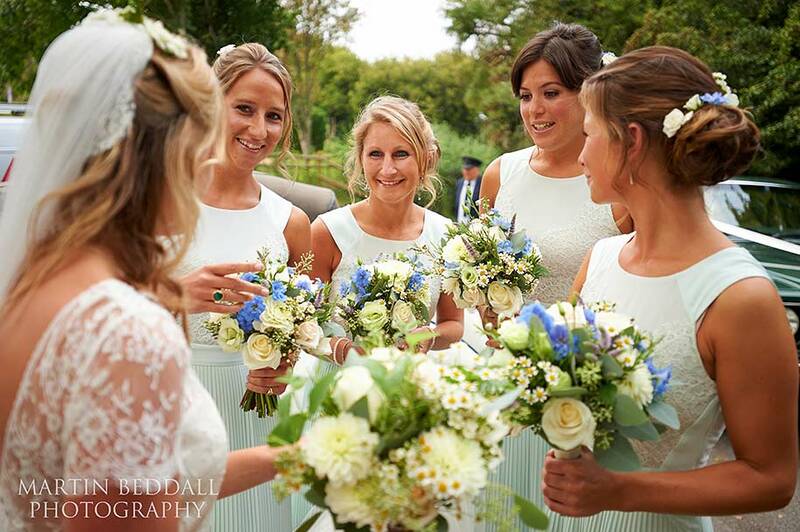 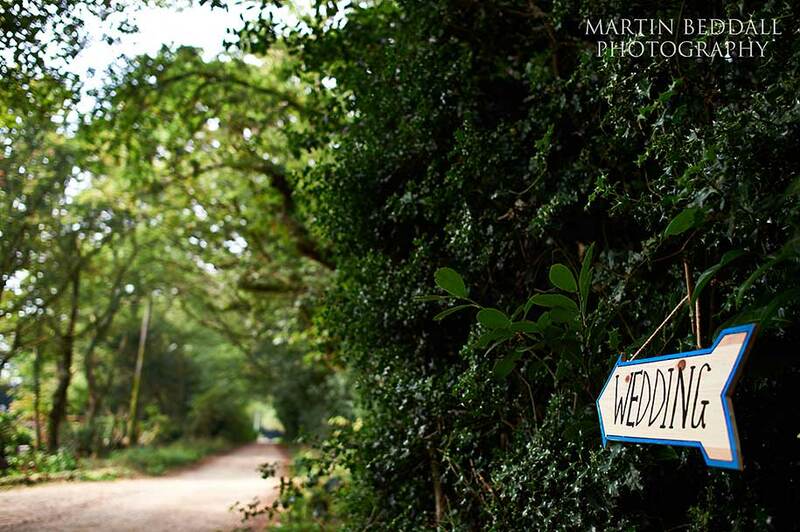 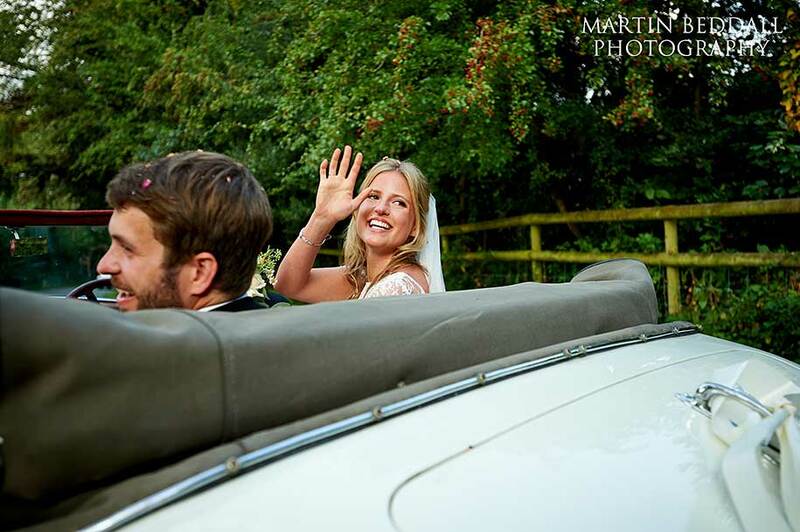 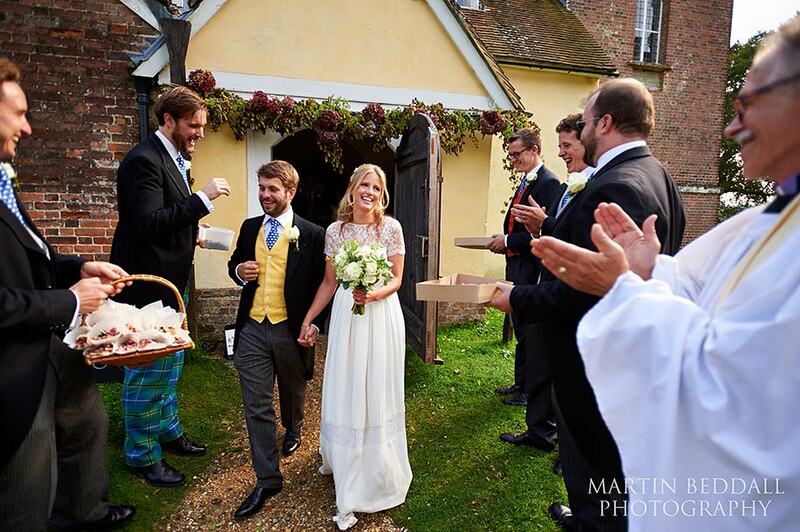 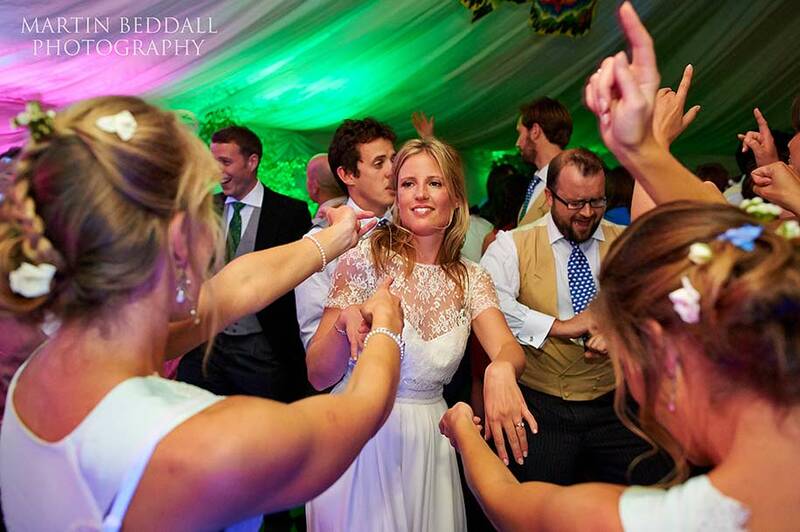 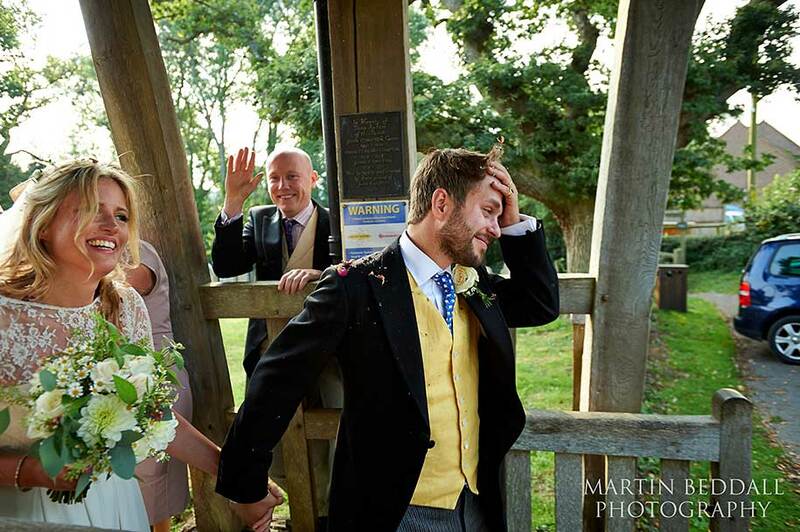 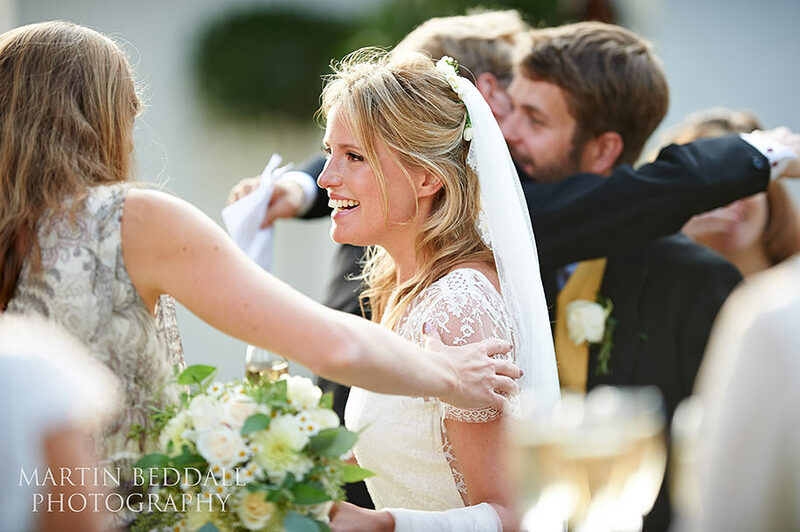 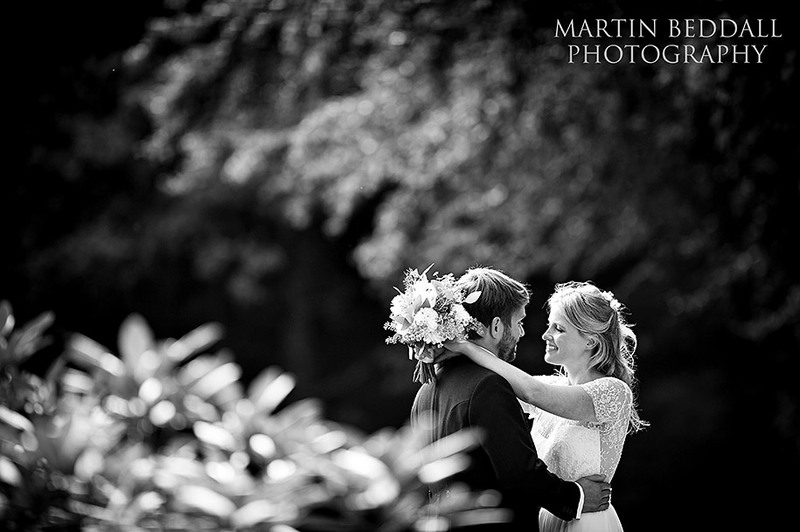 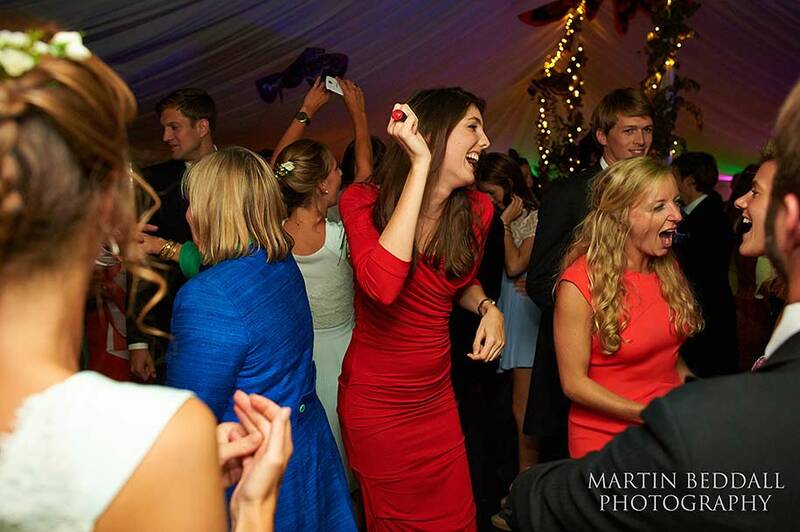 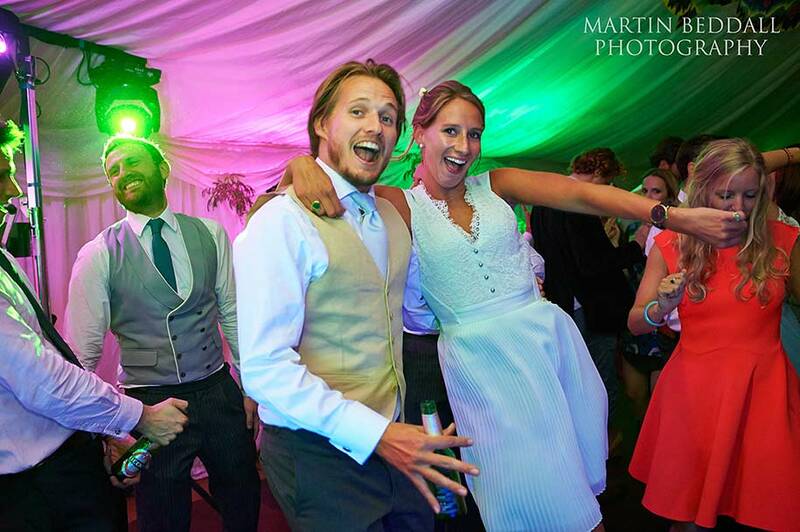 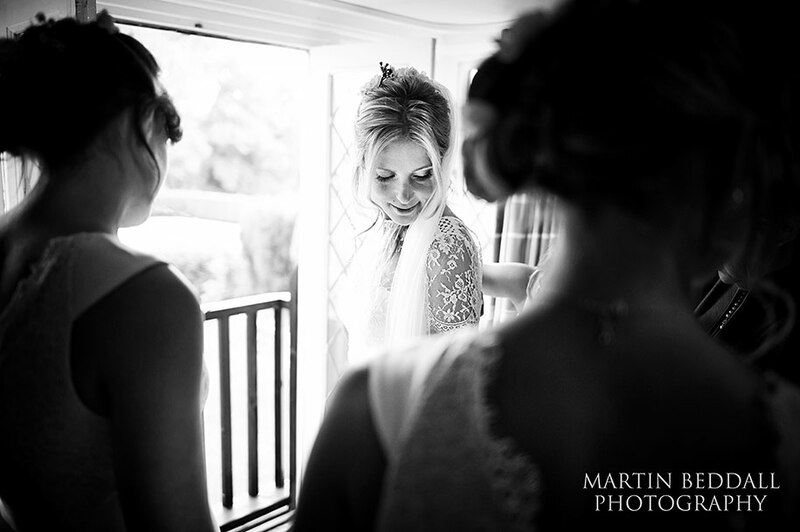 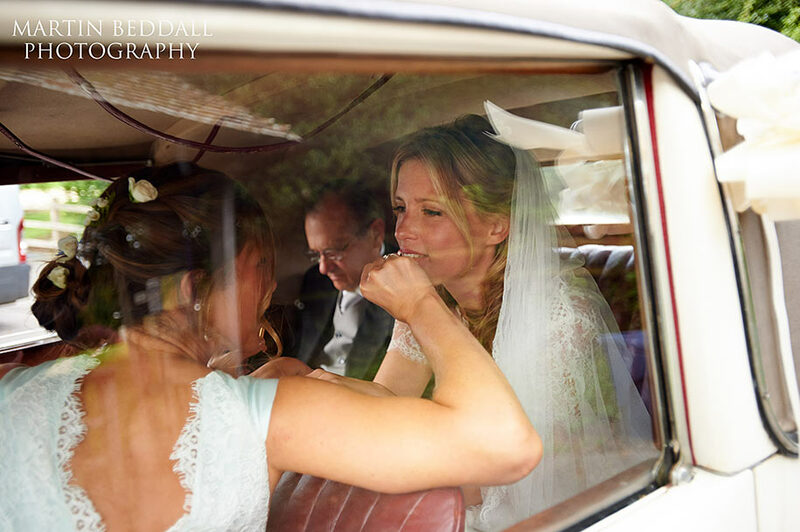 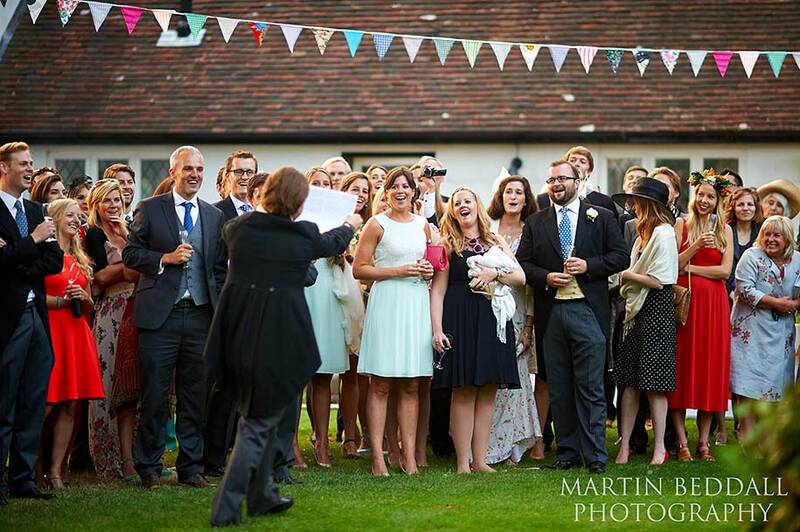 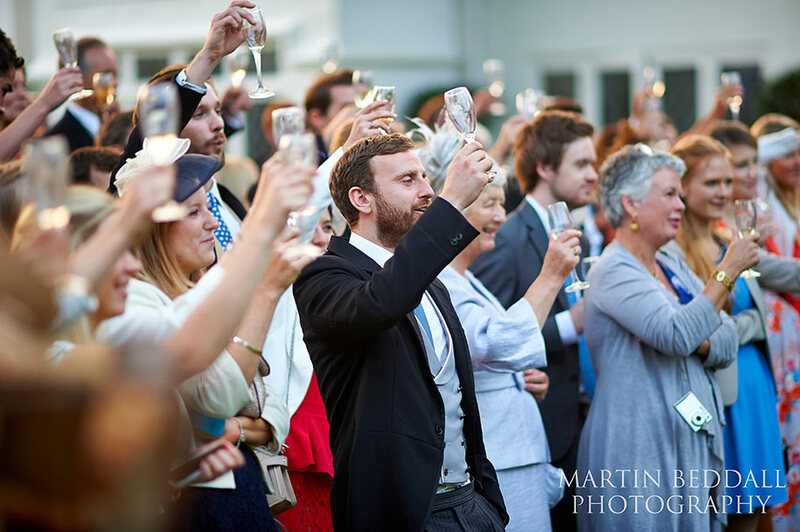 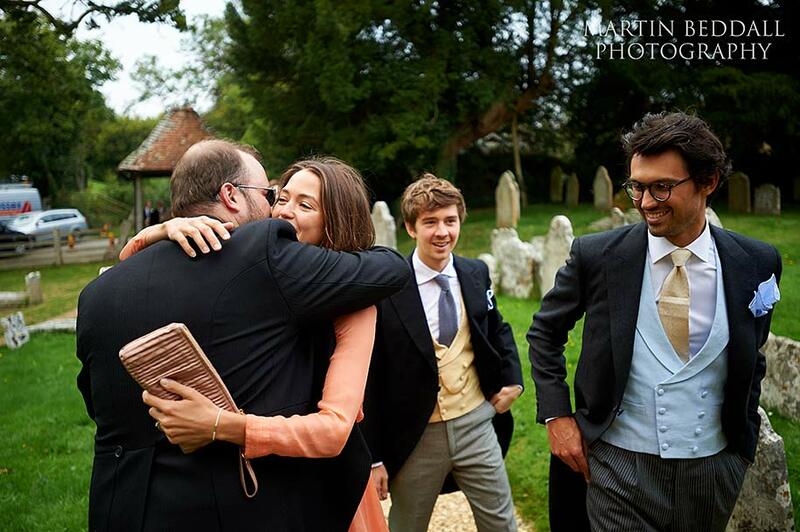 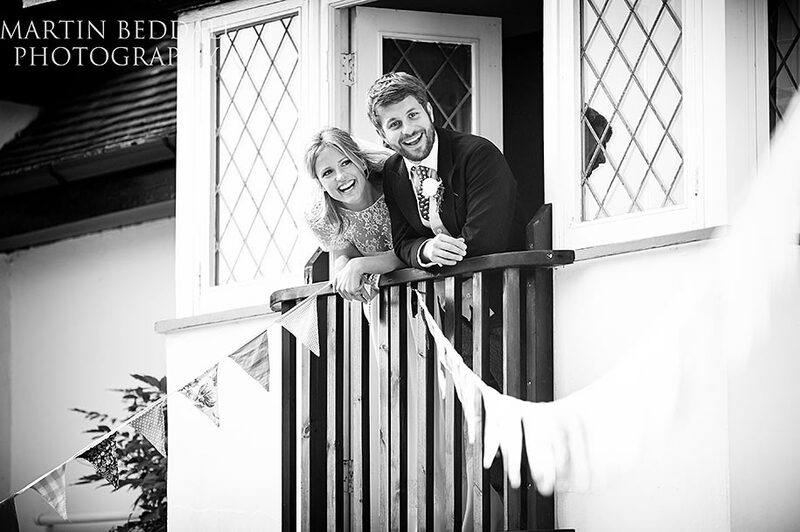 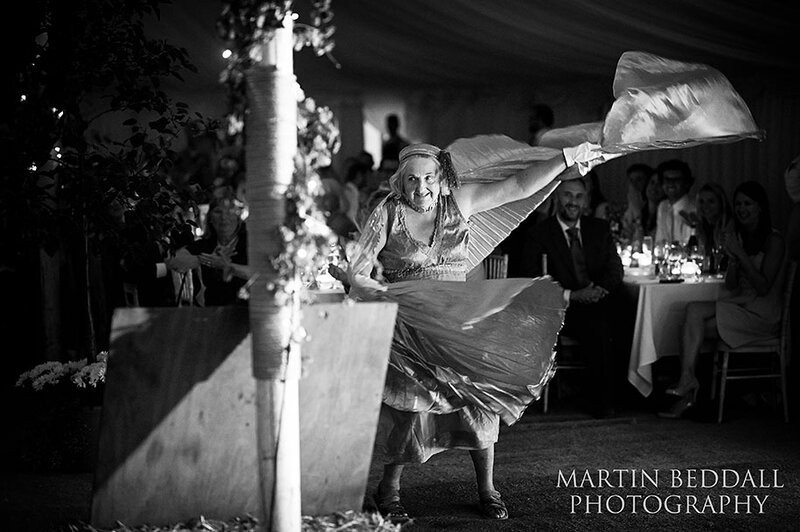 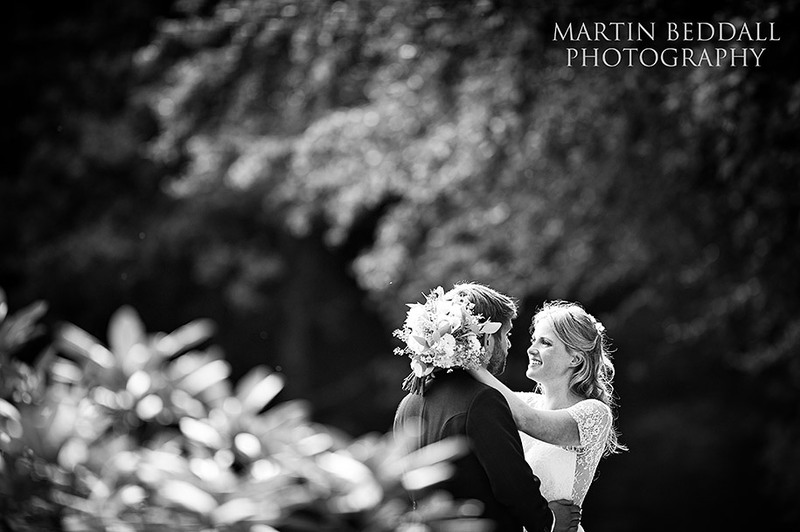 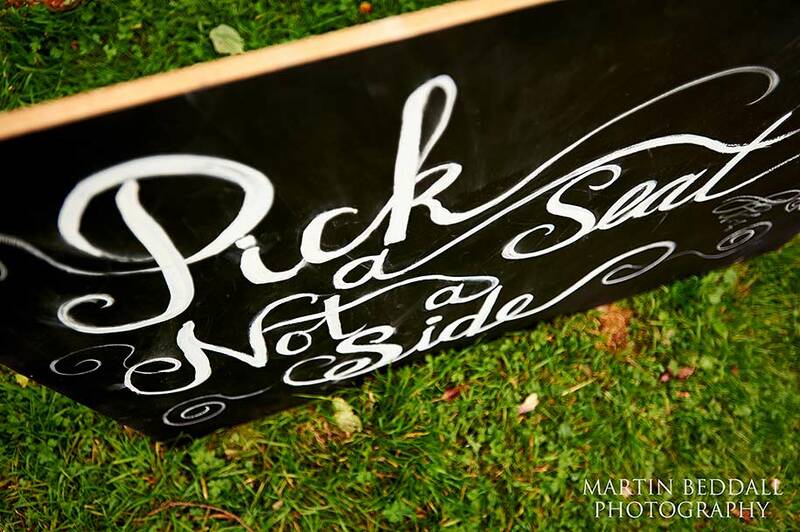 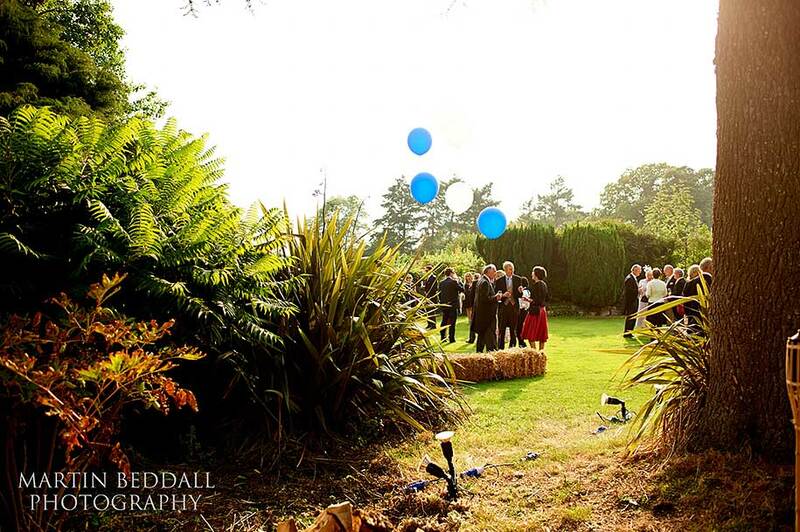 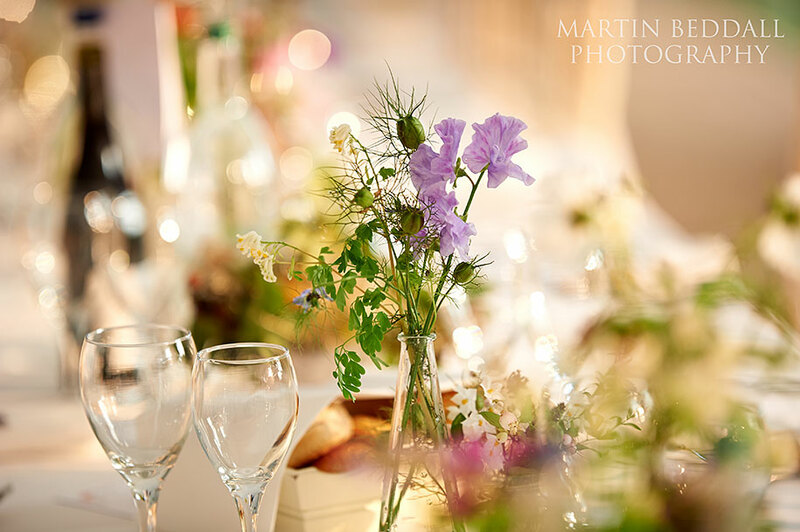 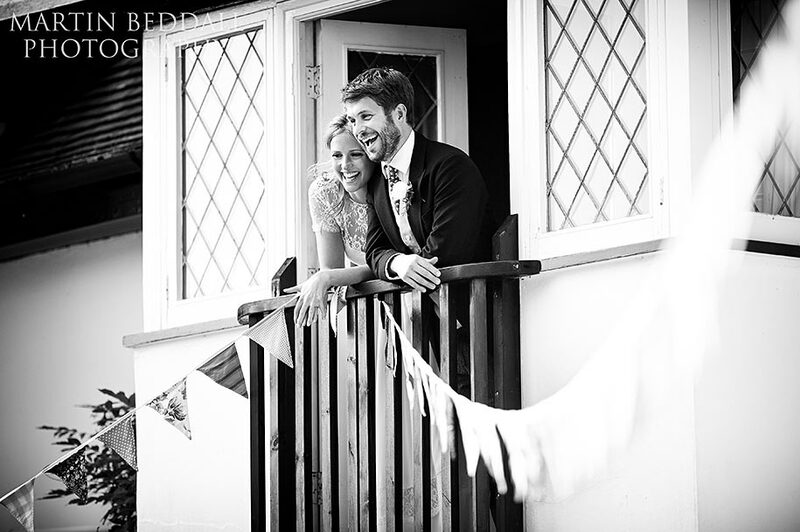 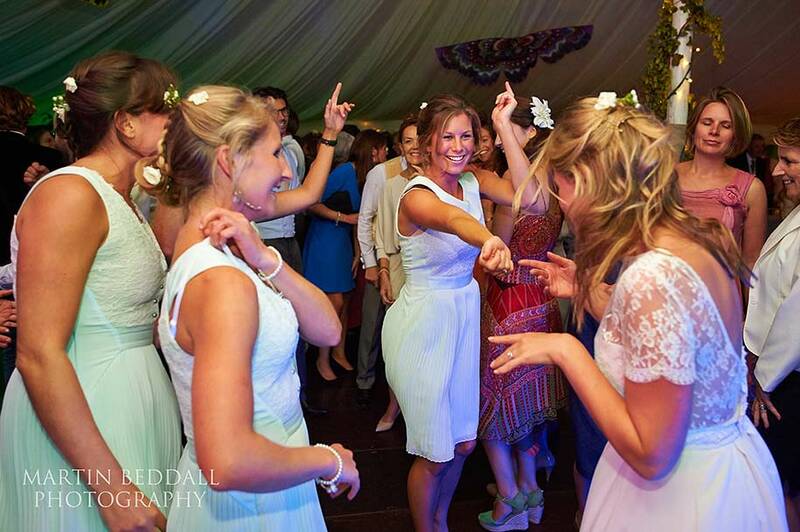 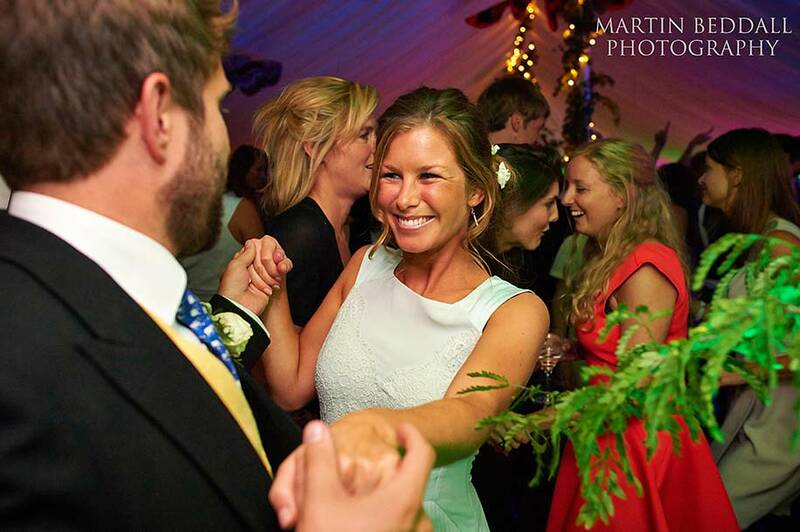 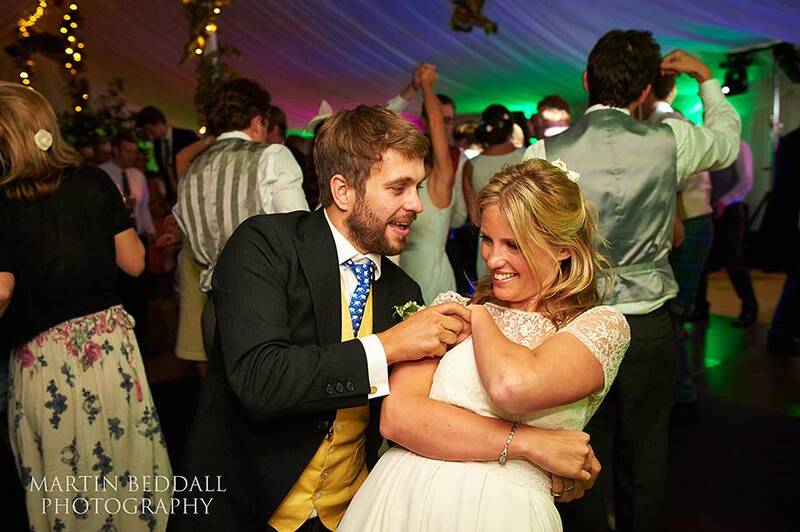 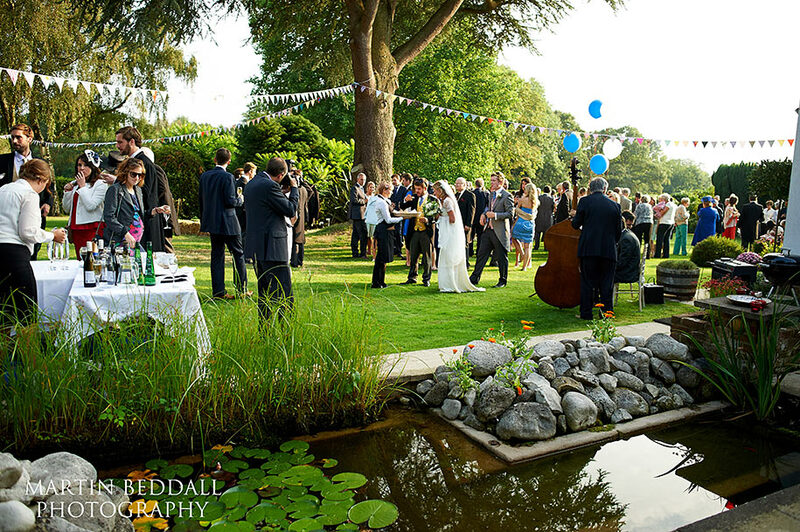 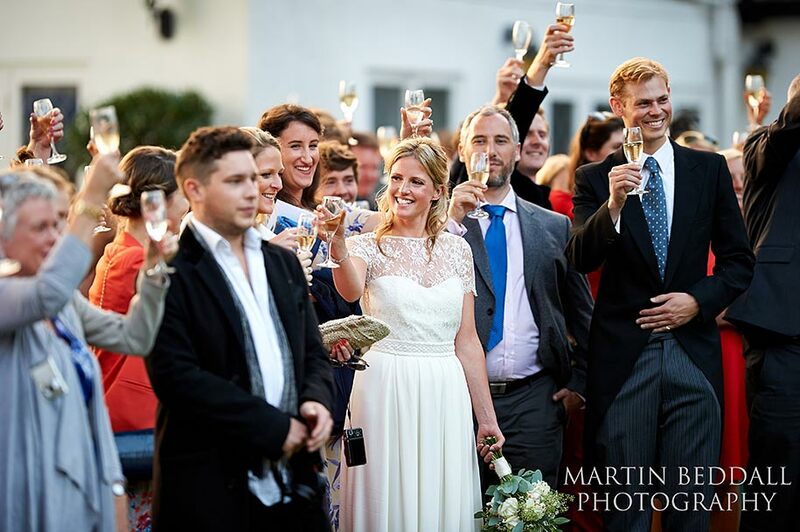 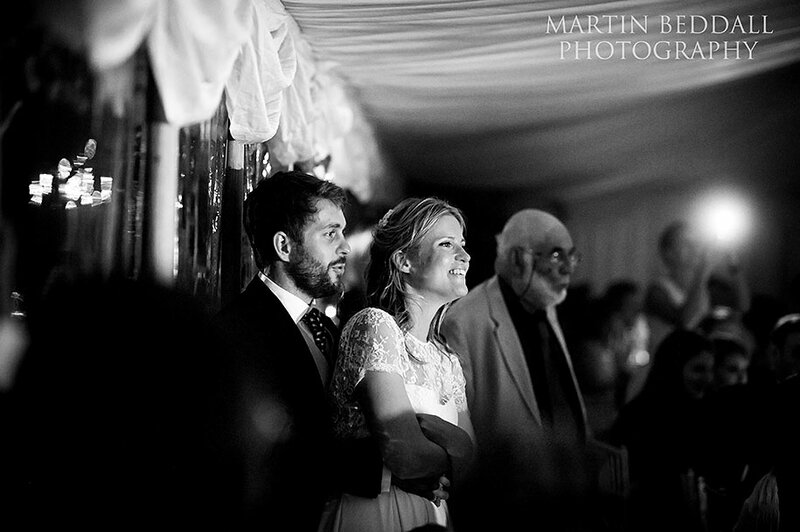 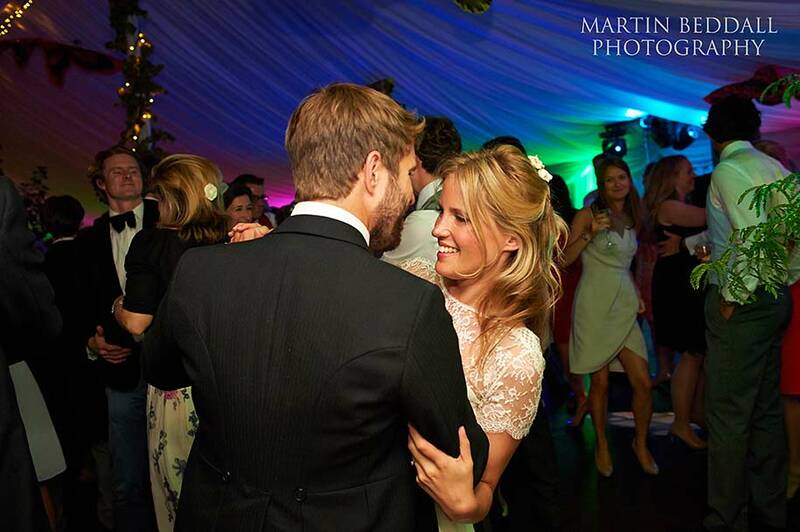 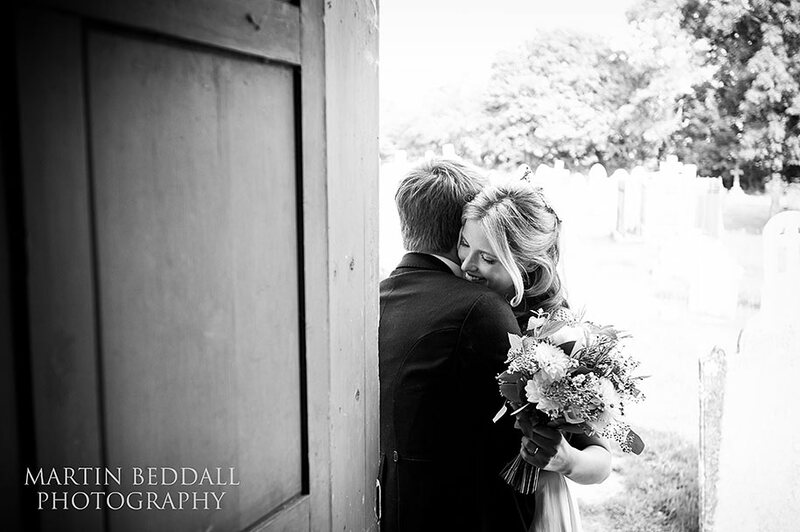 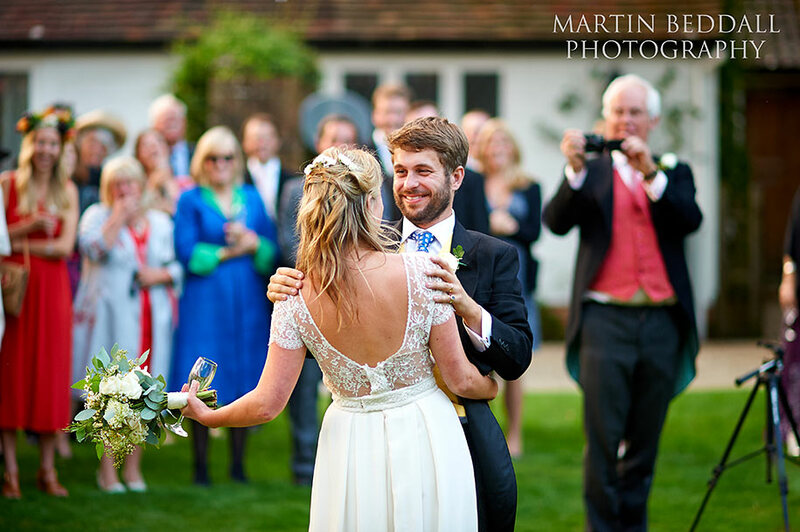 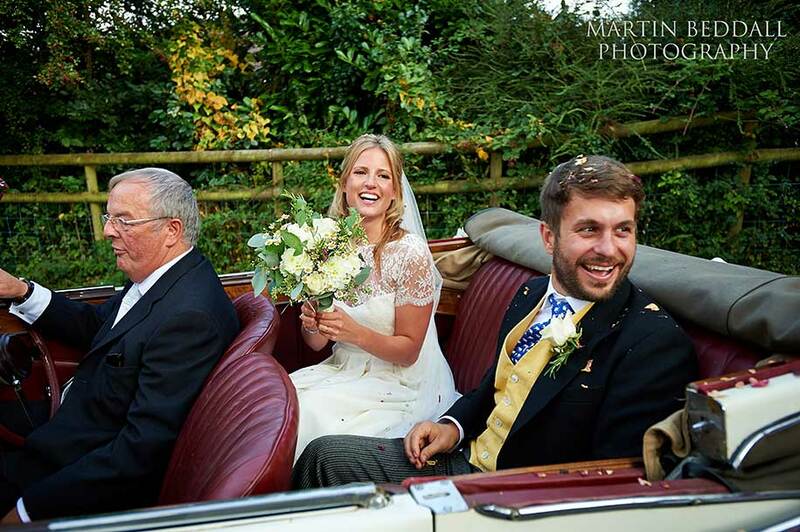 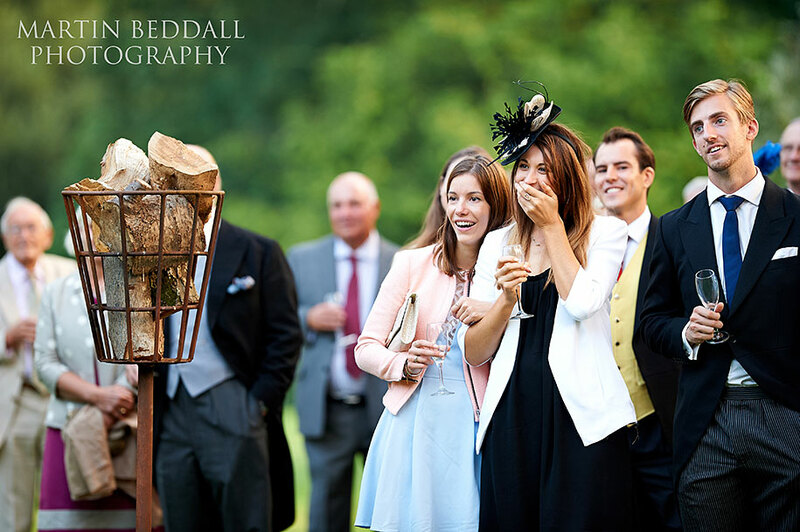 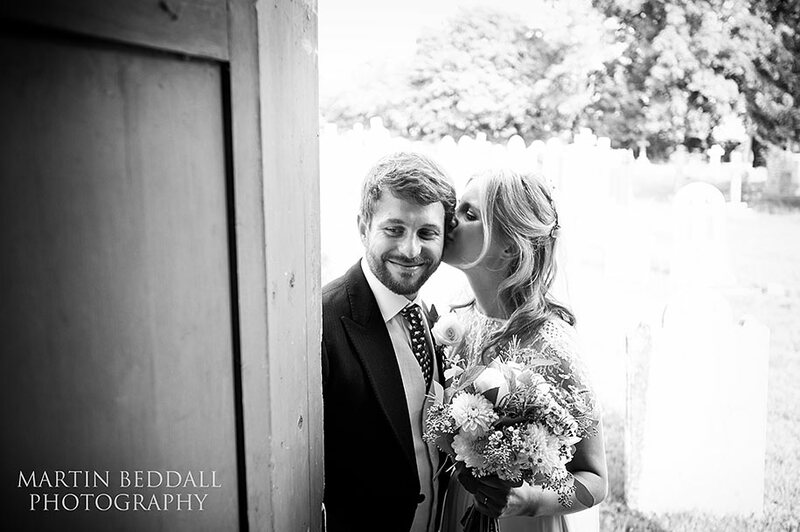 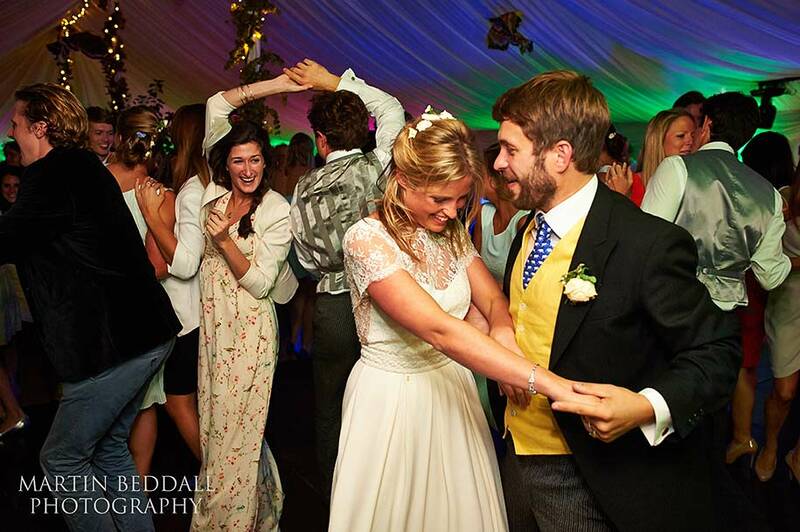 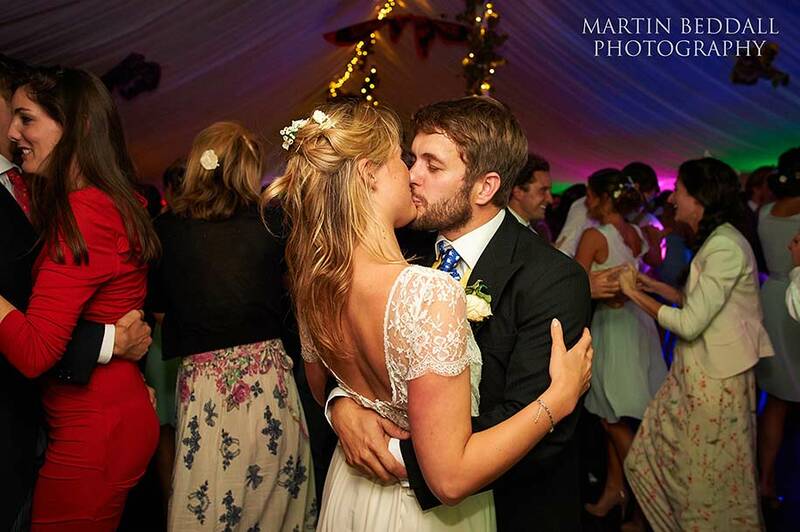 A New Forest wedding last Saturday for childhood sweethearts Claire and Robin. 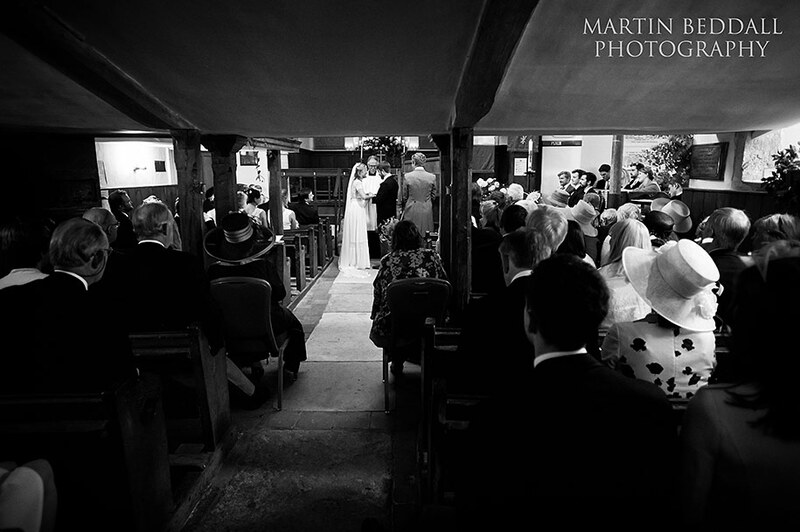 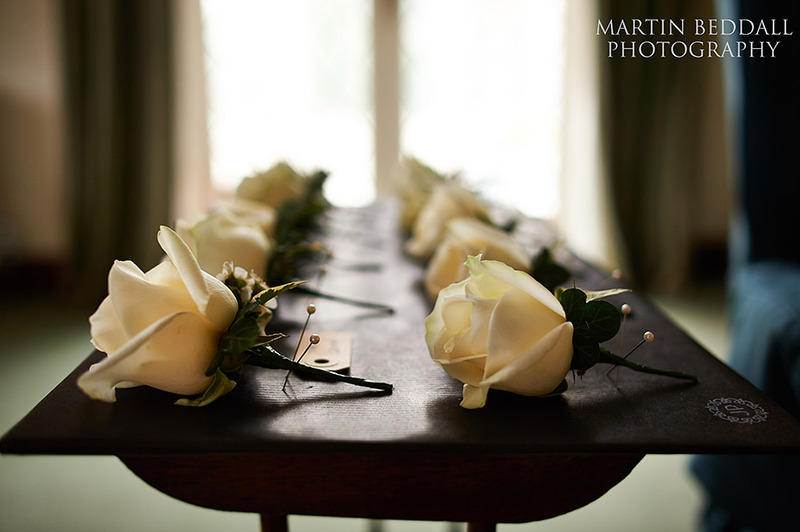 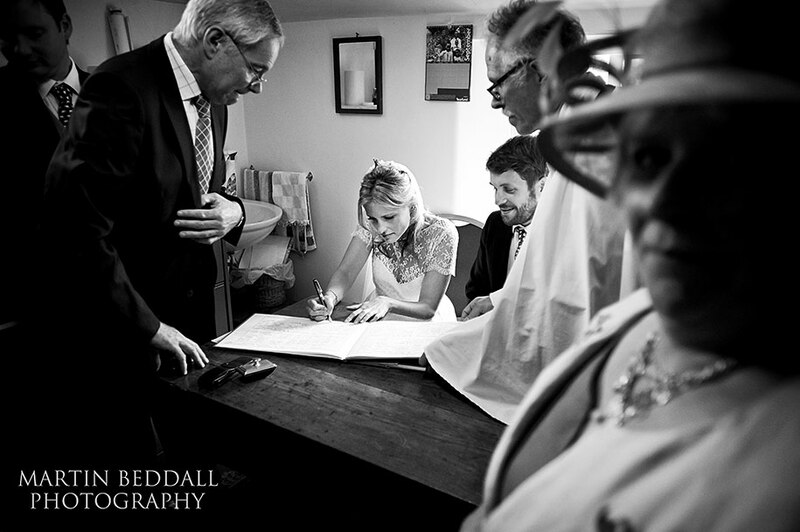 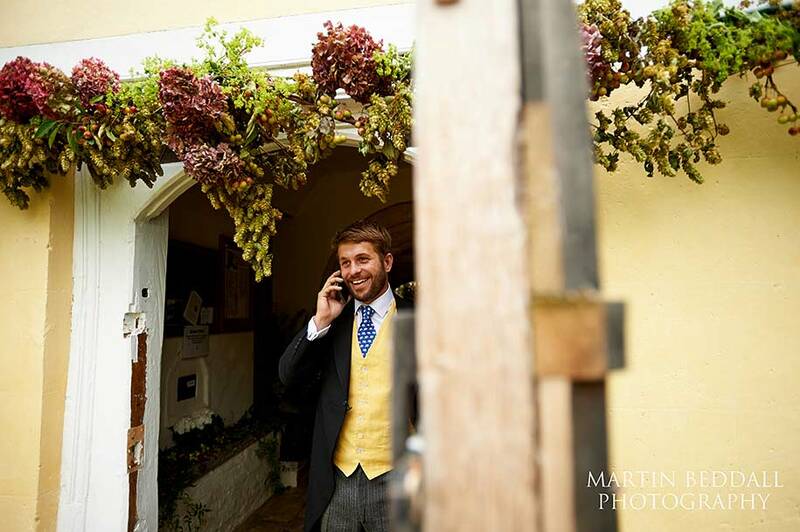 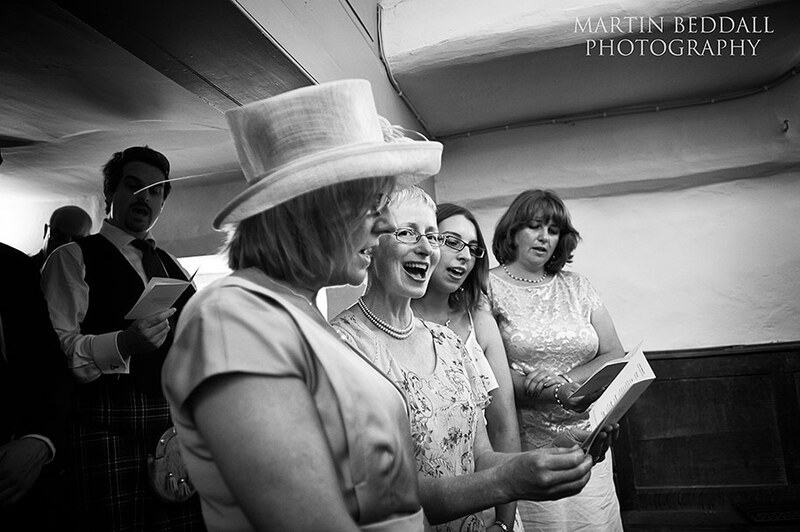 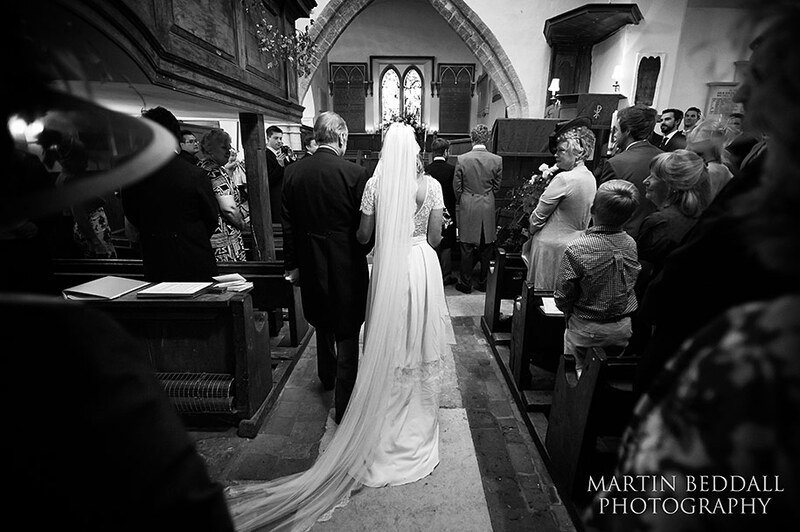 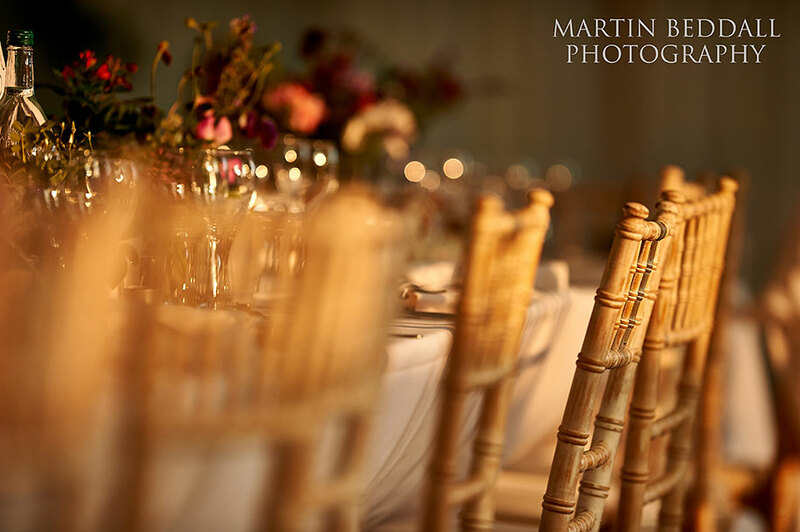 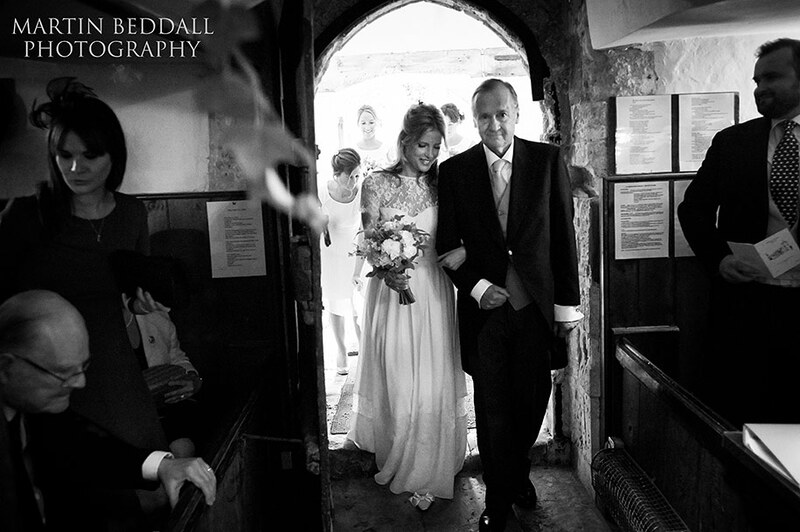 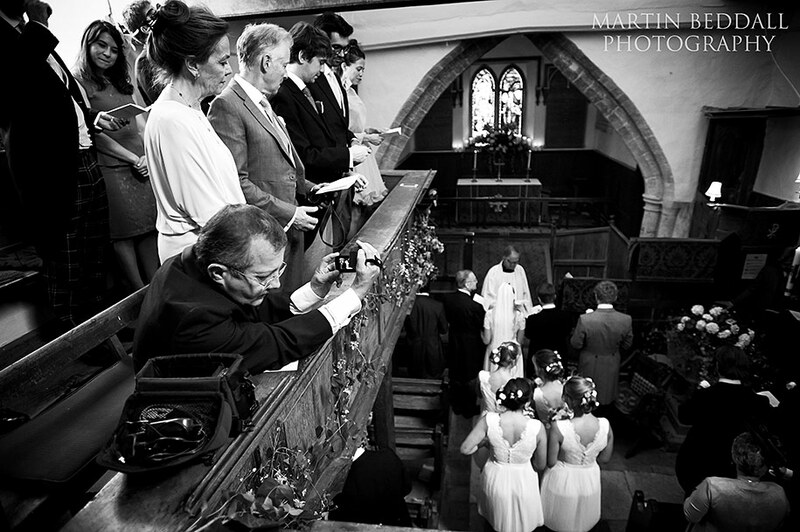 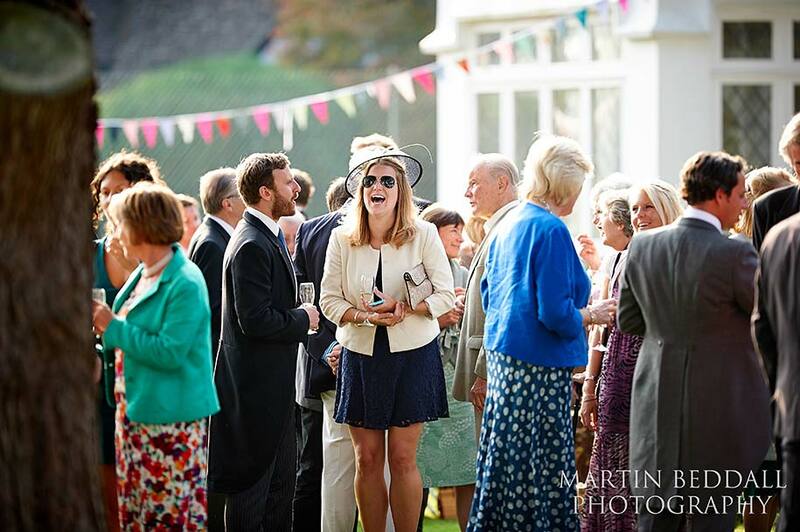 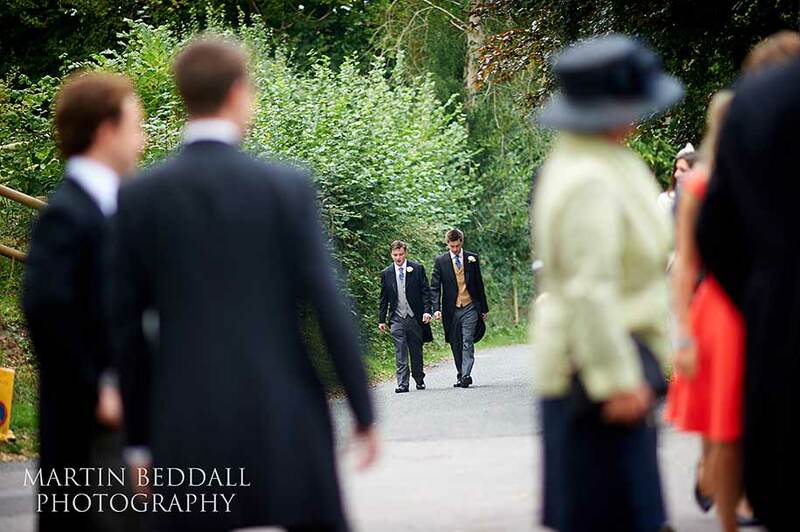 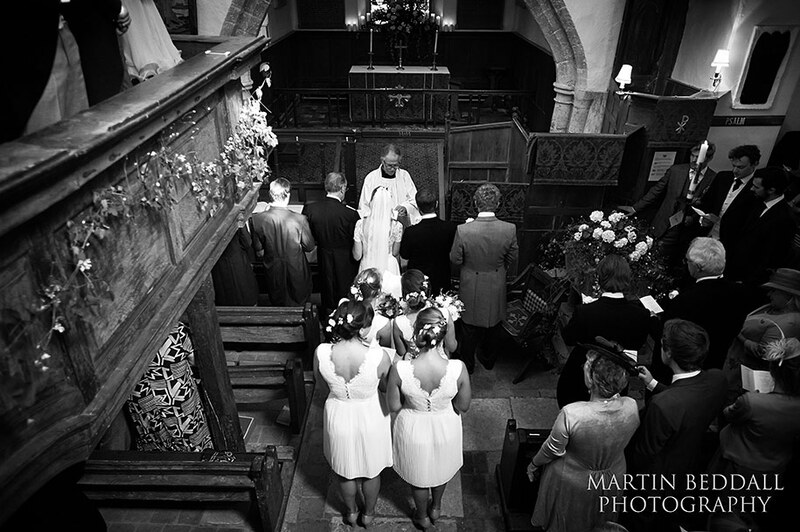 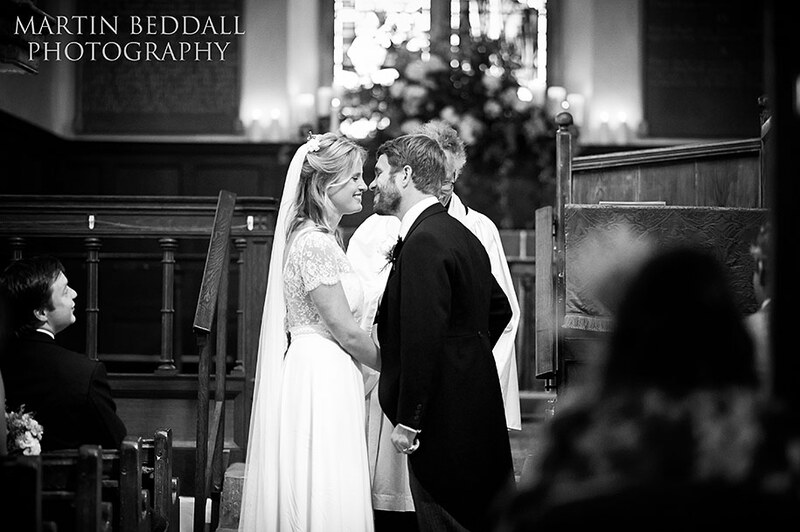 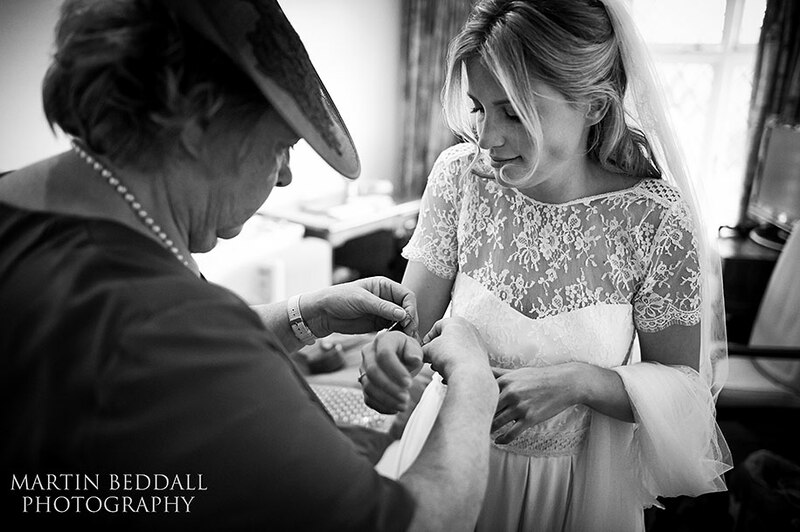 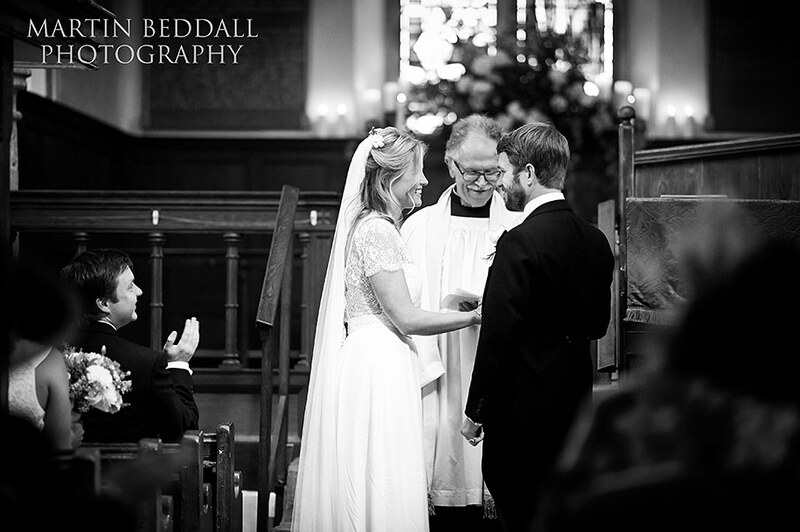 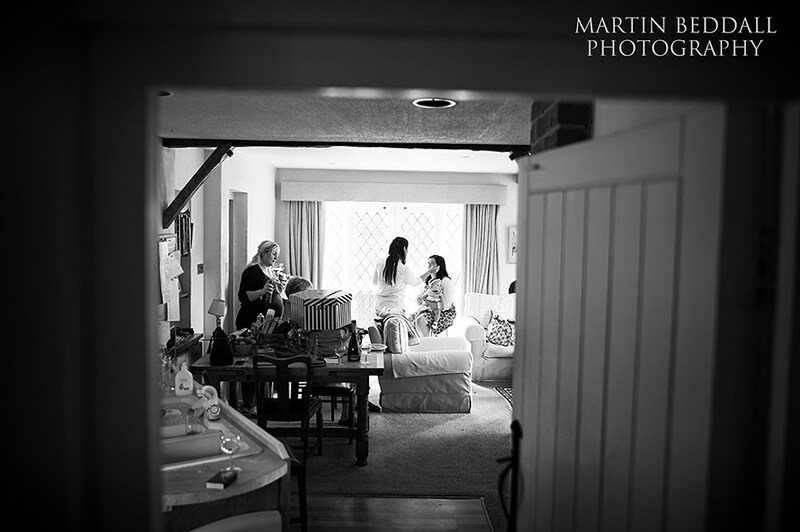 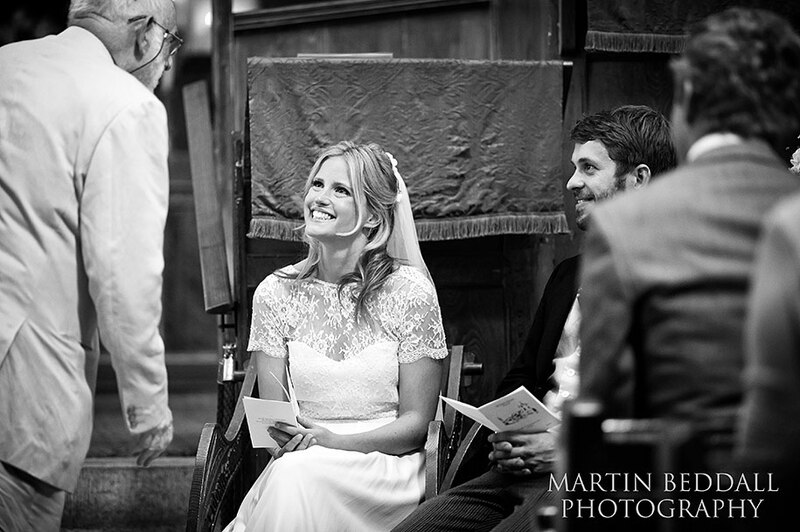 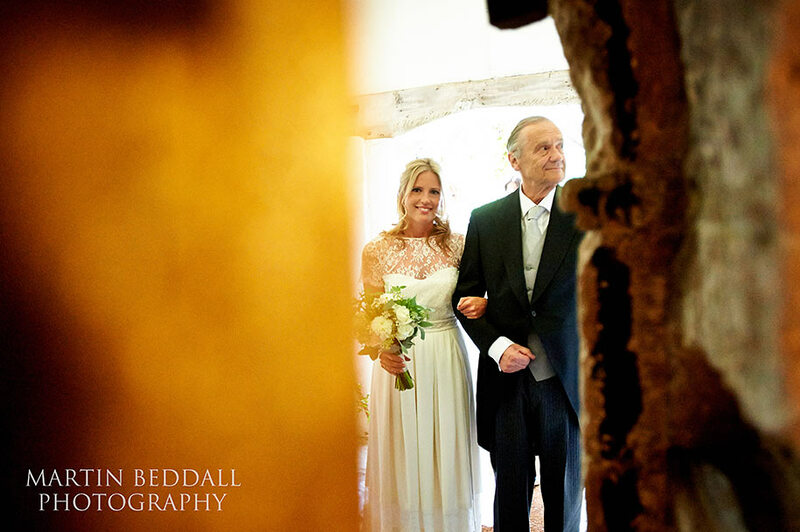 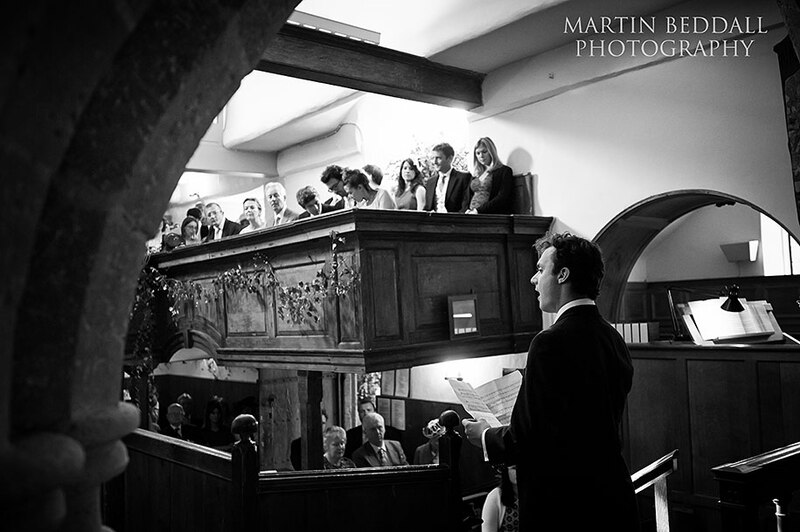 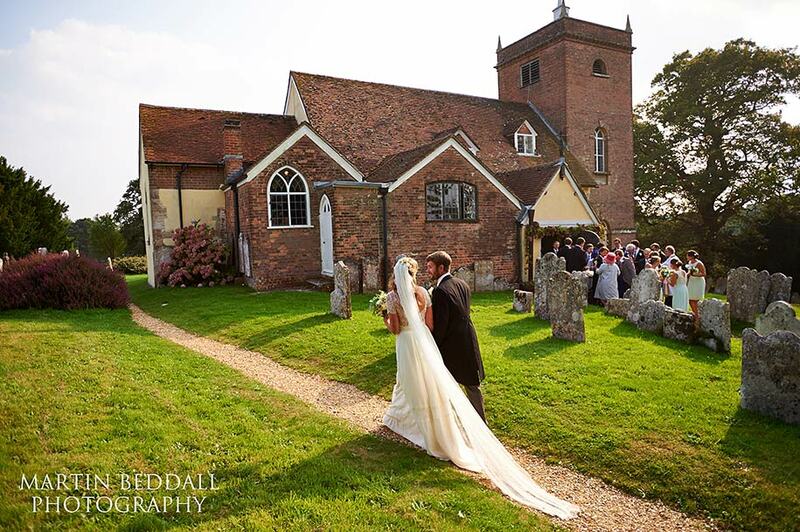 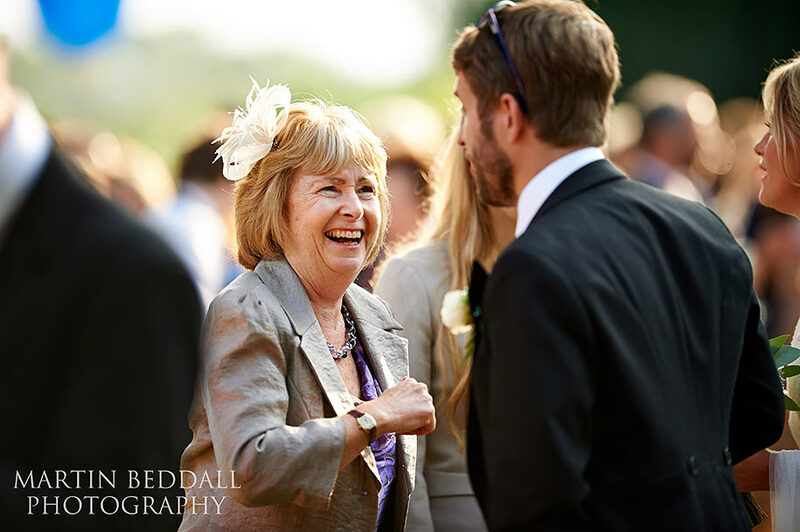 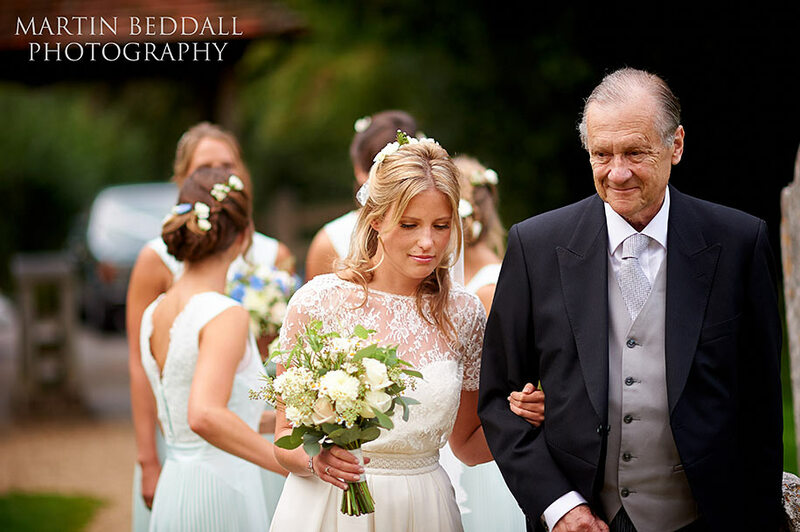 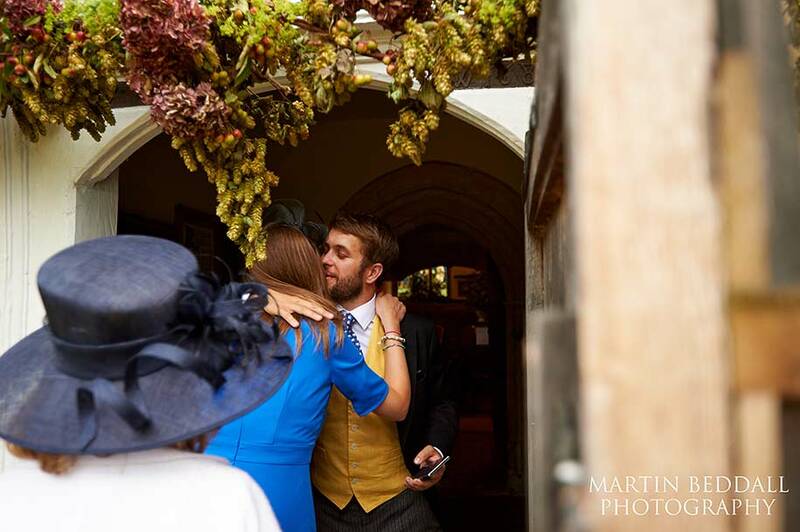 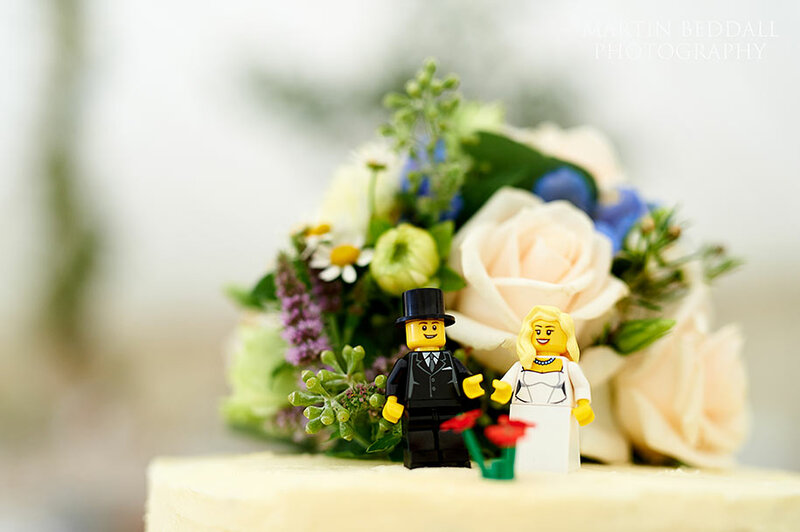 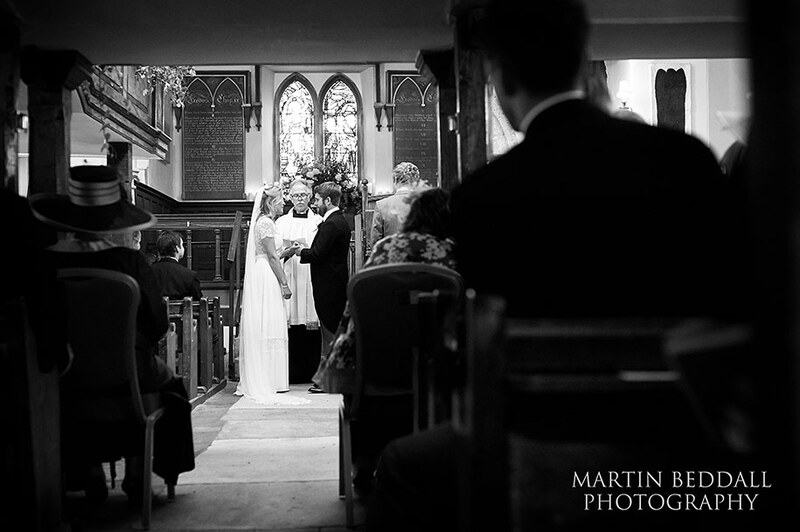 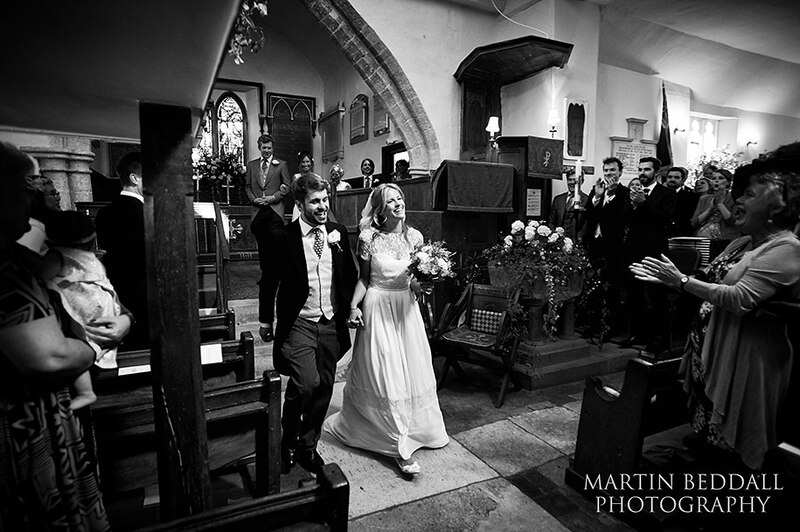 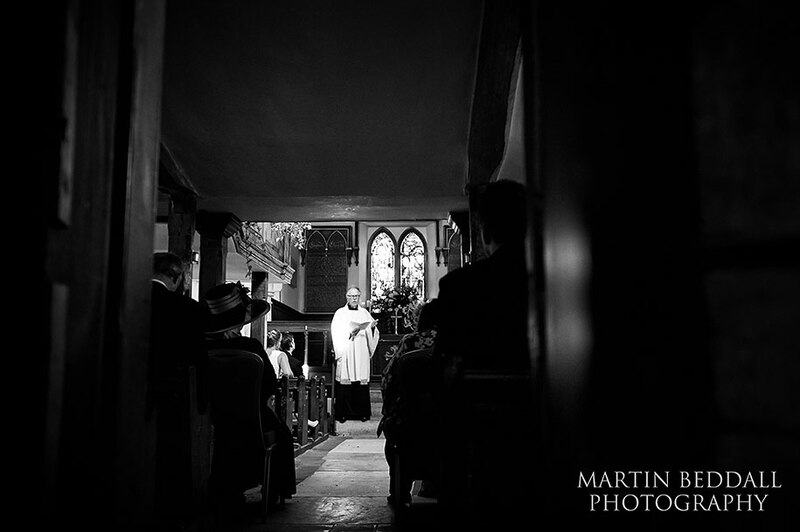 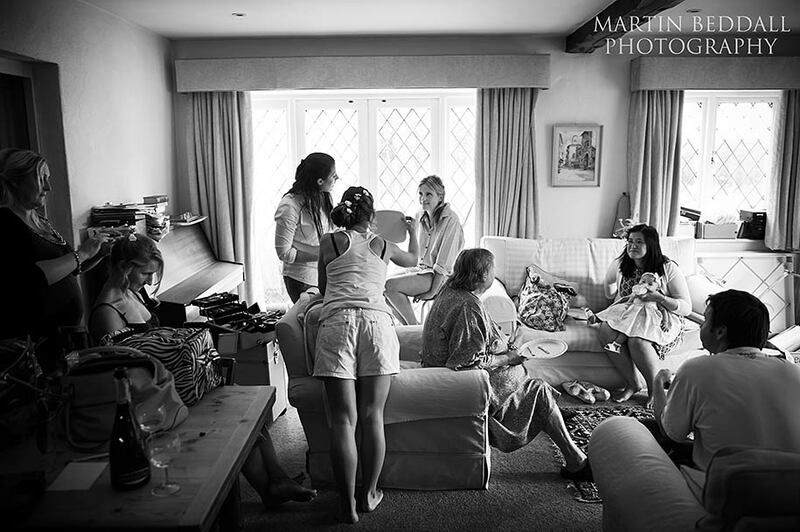 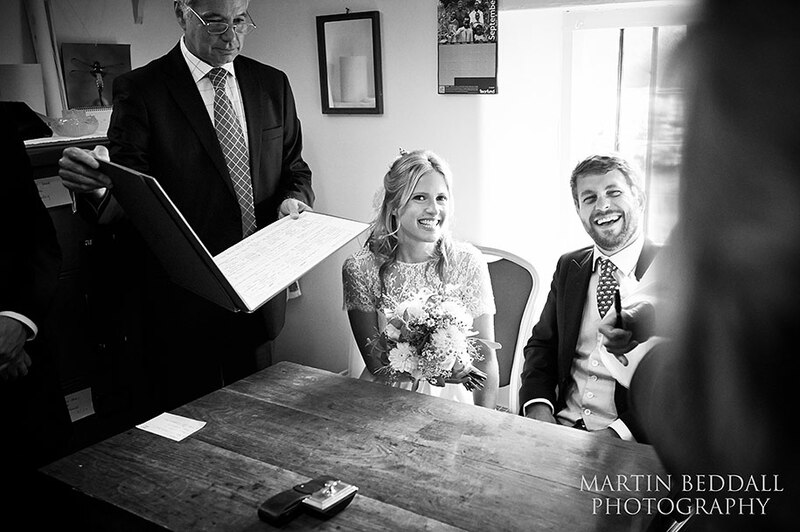 A wedding centred around Claire’s parents’ home, with a ceremony in the church where she was christened. 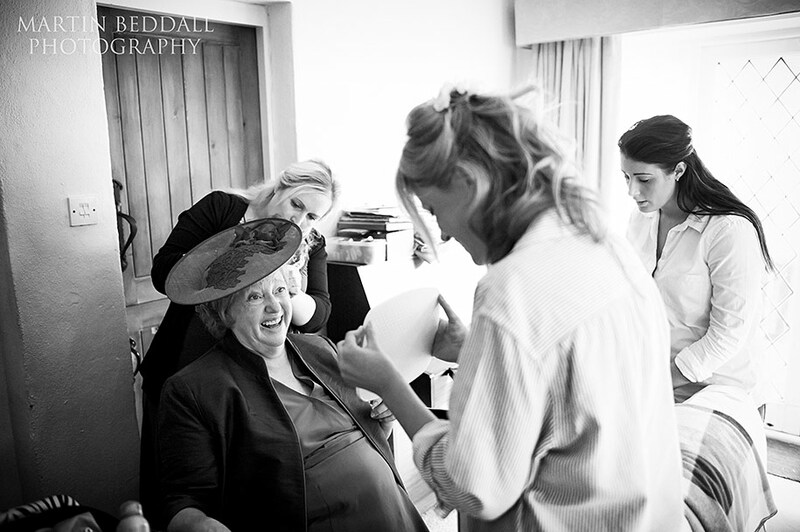 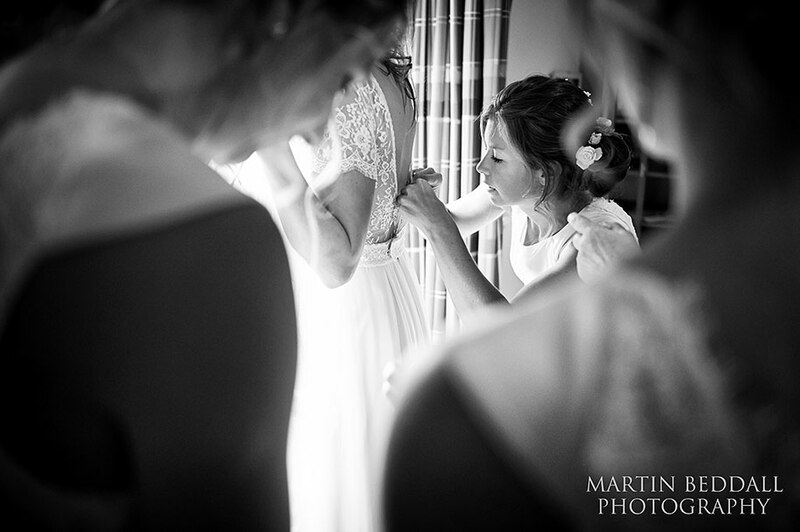 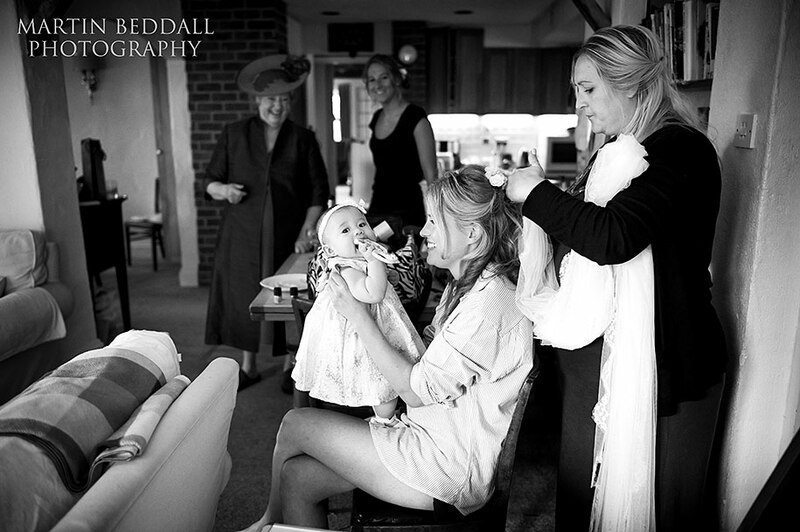 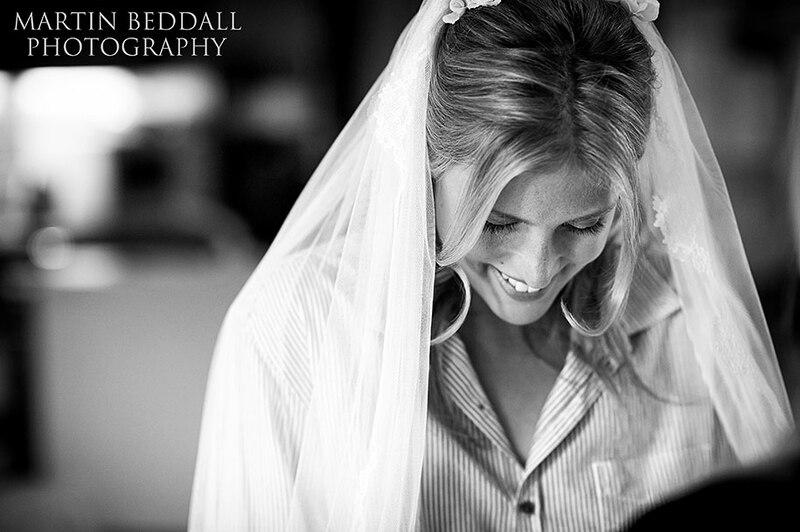 Before the service, Claire was getting ready at her parents’ home with family and friends. 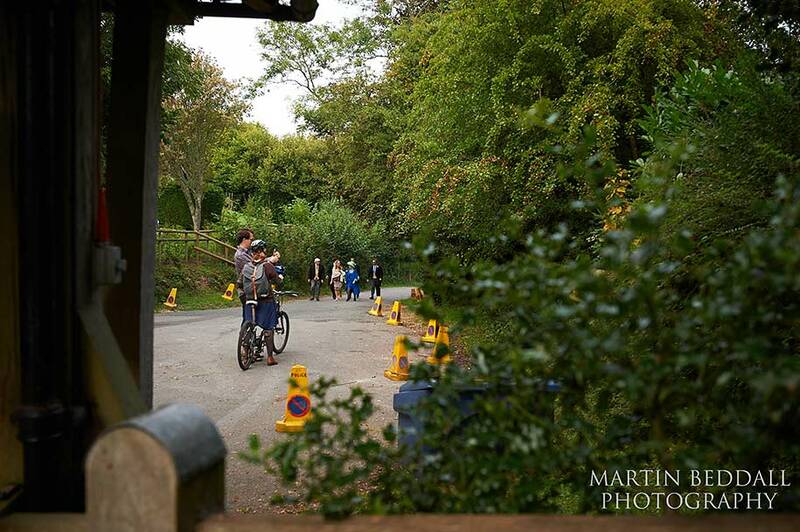 At this point the weather was cloudy and looking rather disappointing. 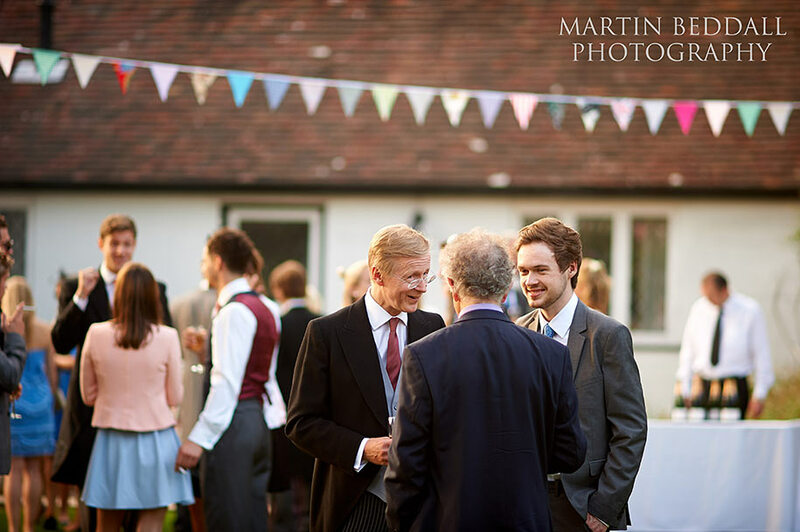 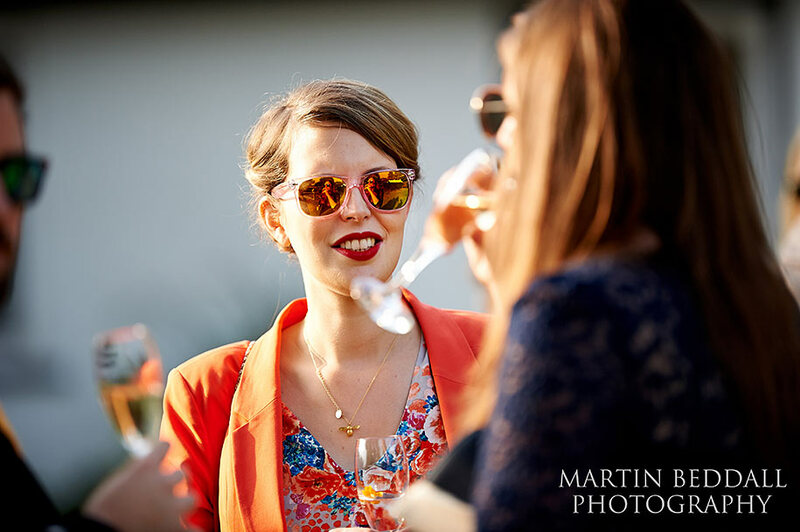 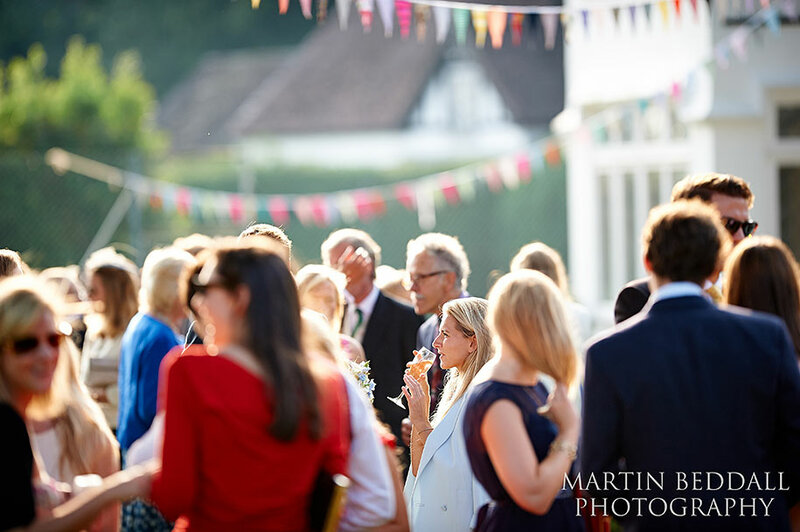 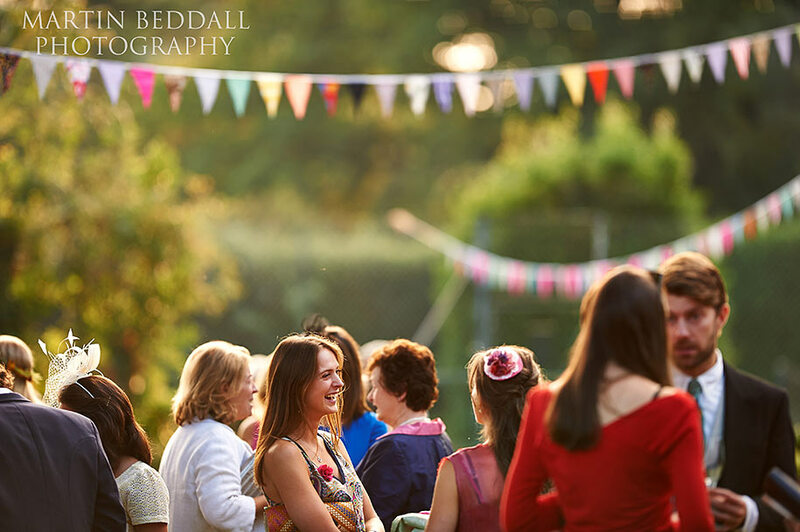 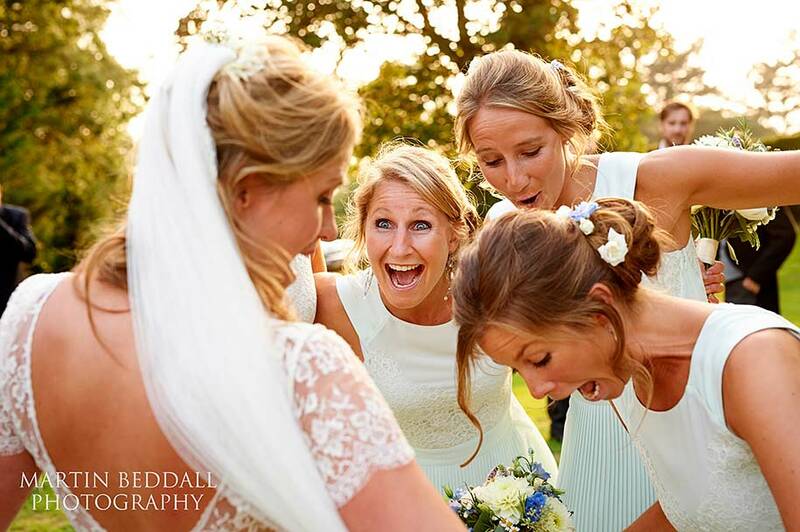 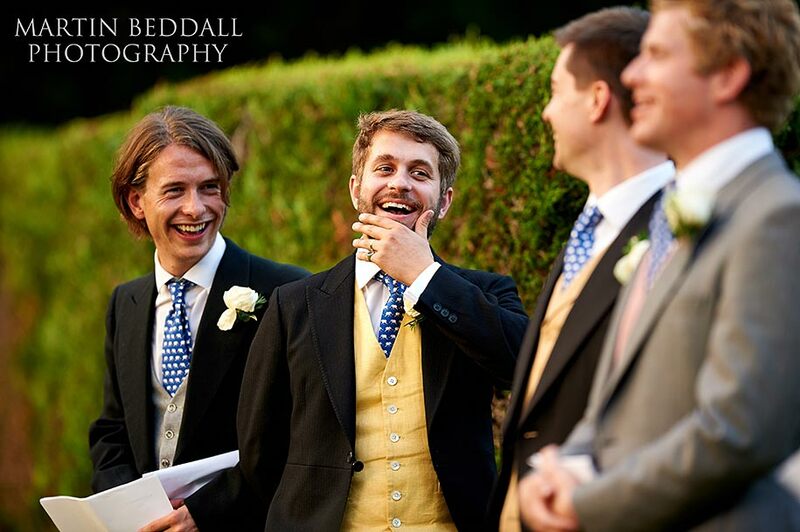 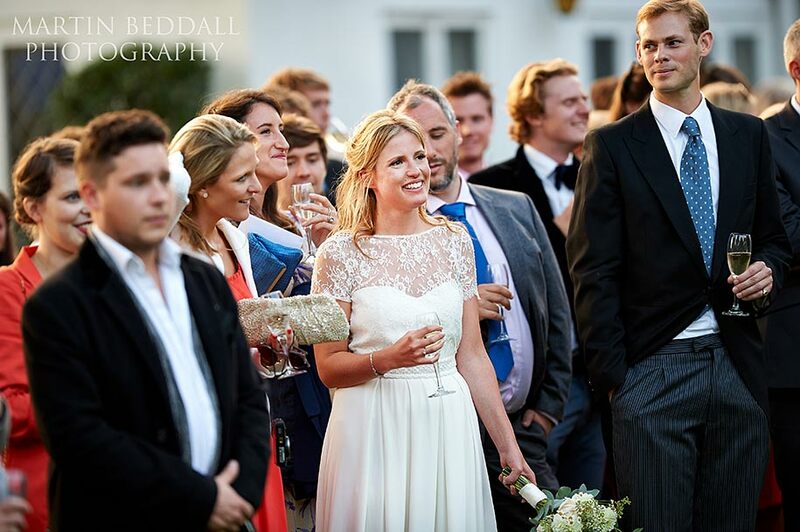 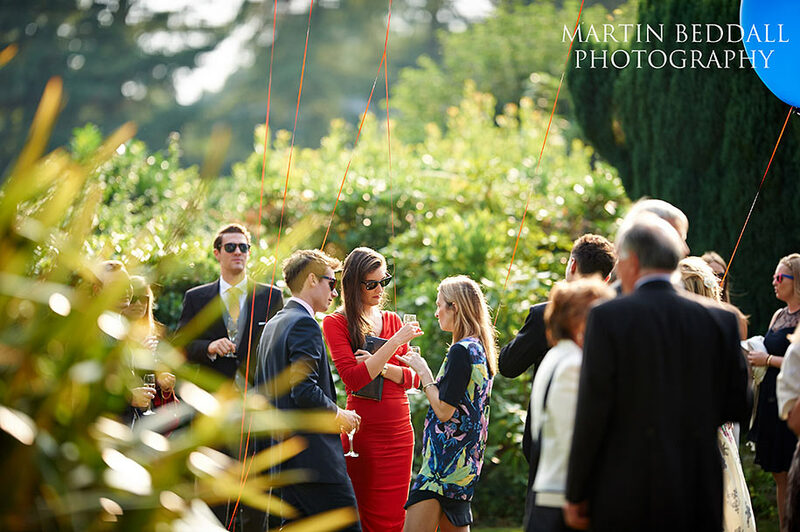 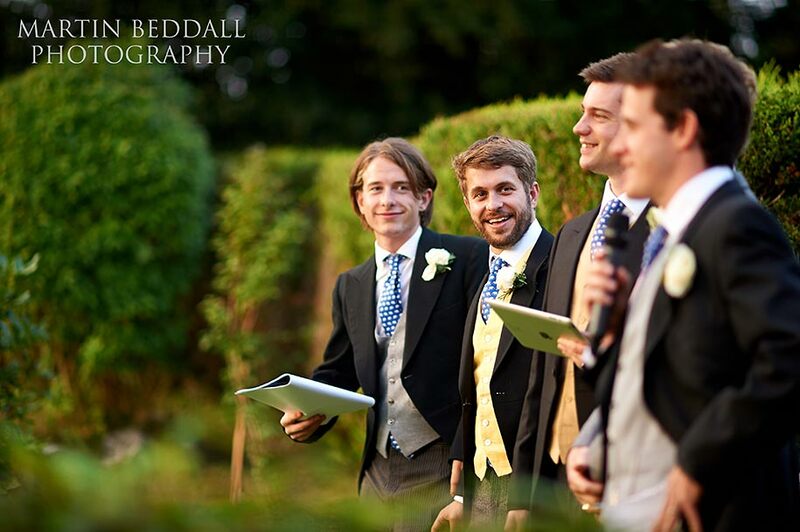 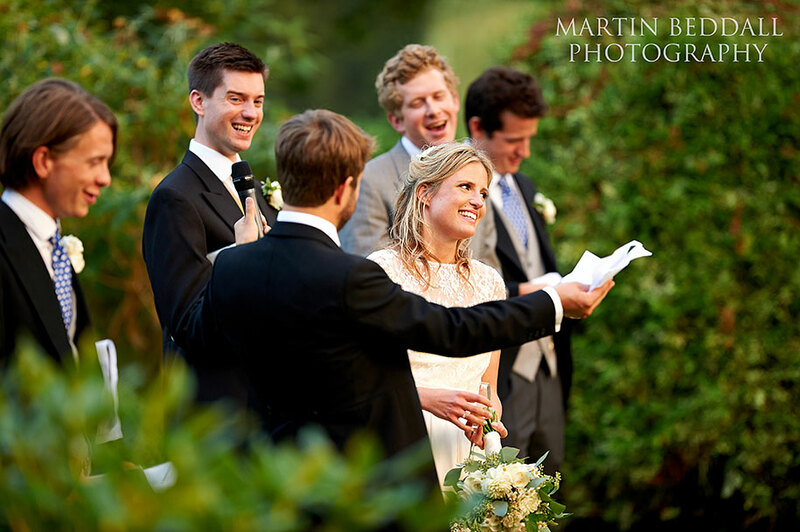 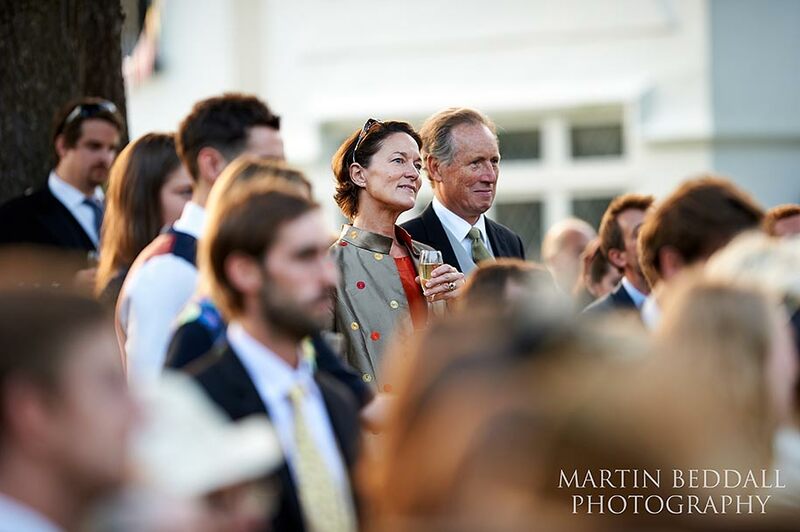 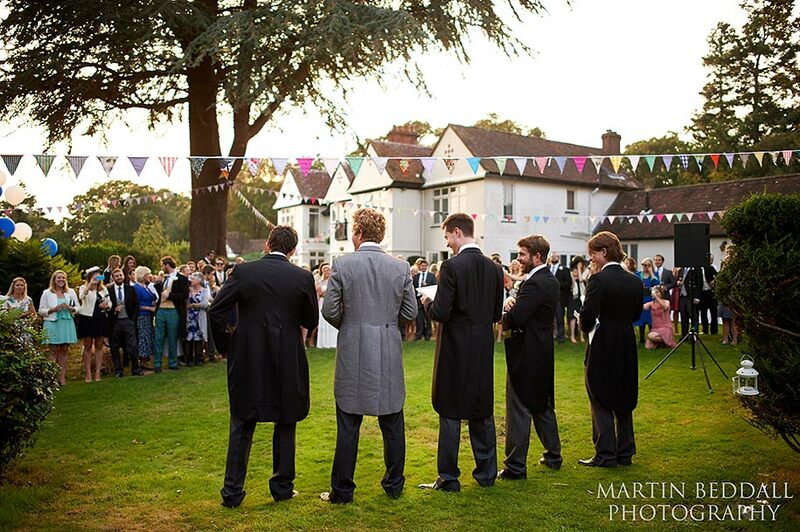 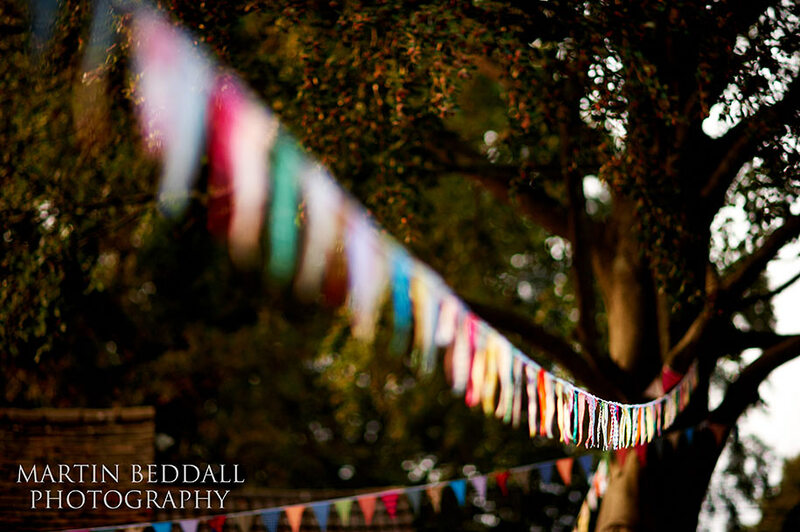 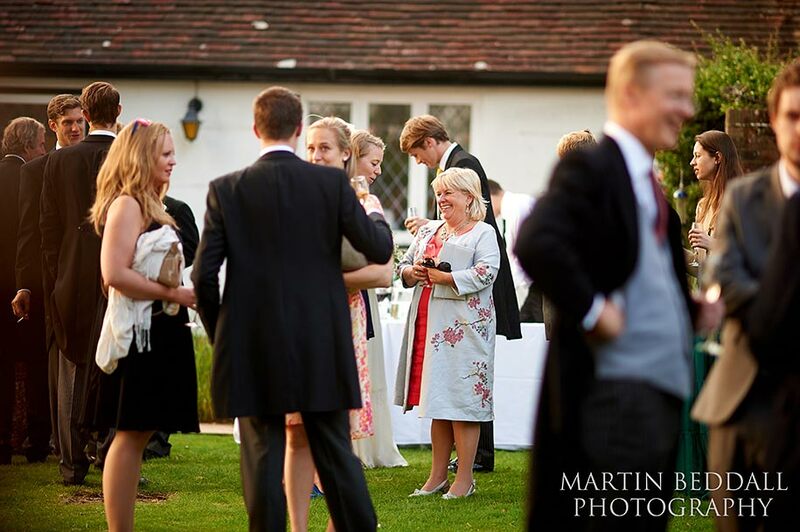 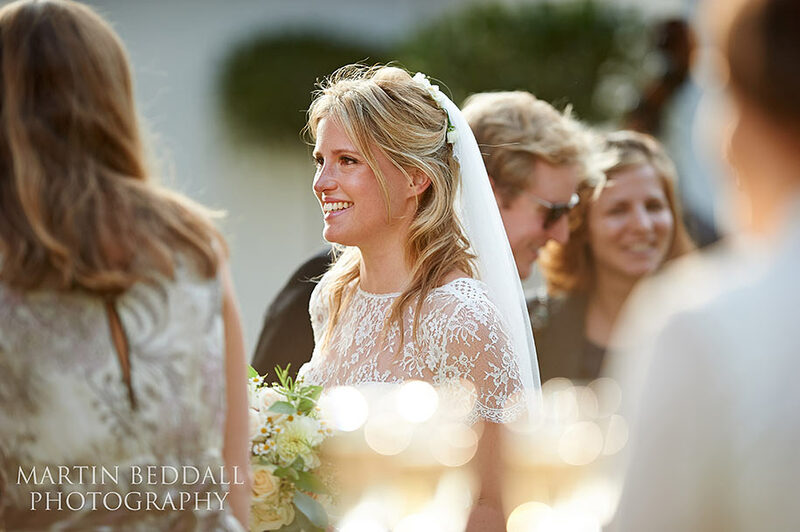 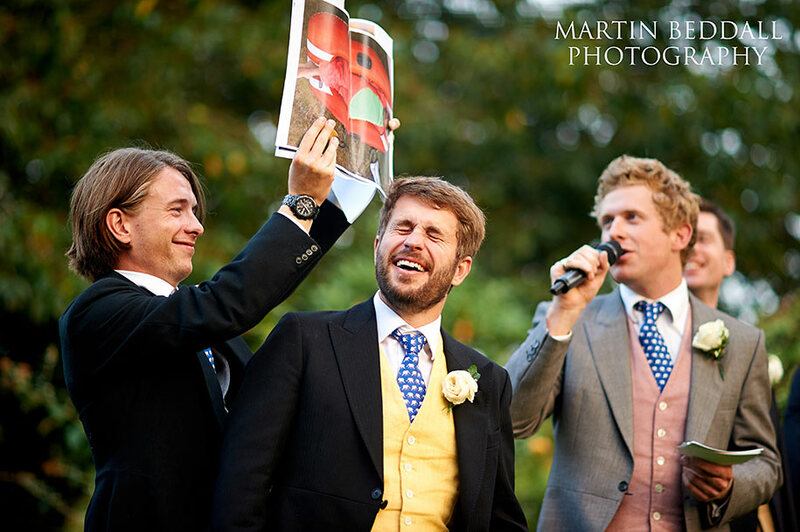 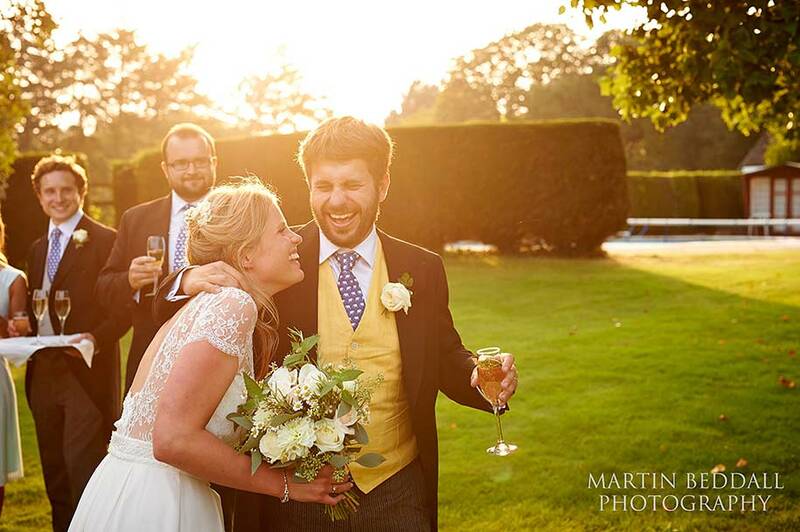 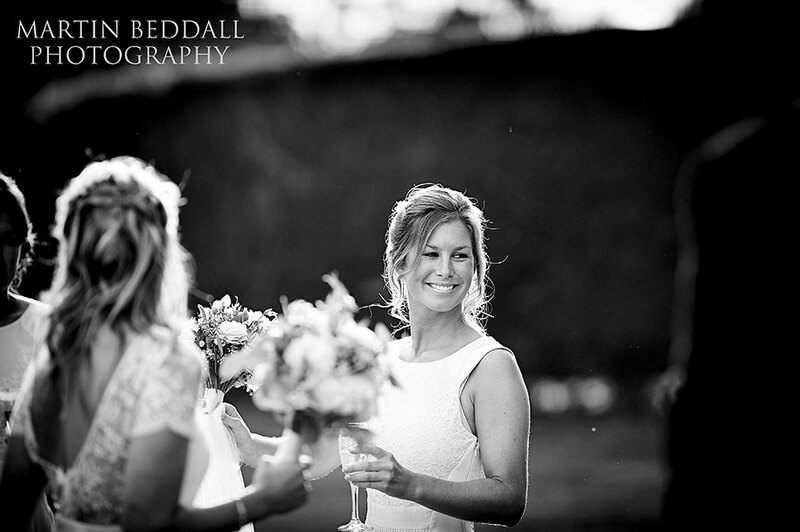 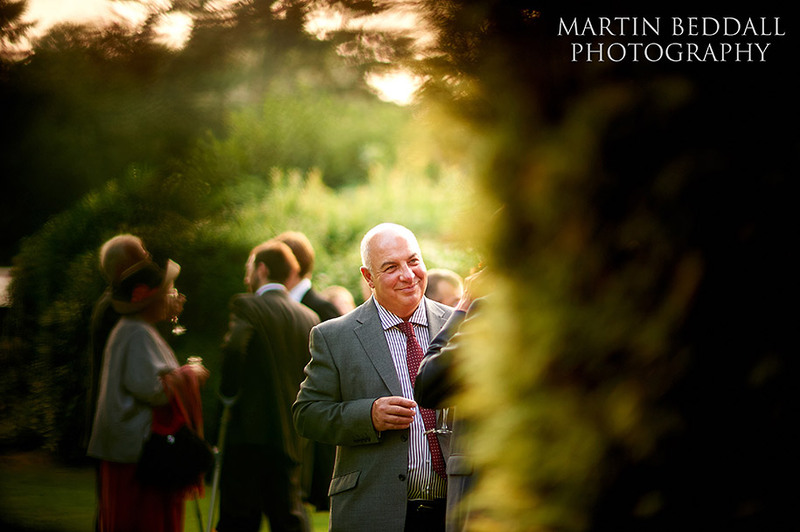 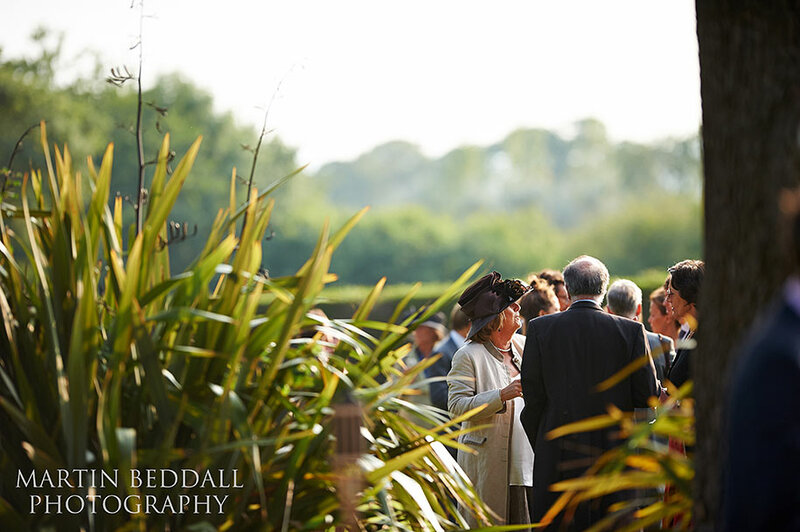 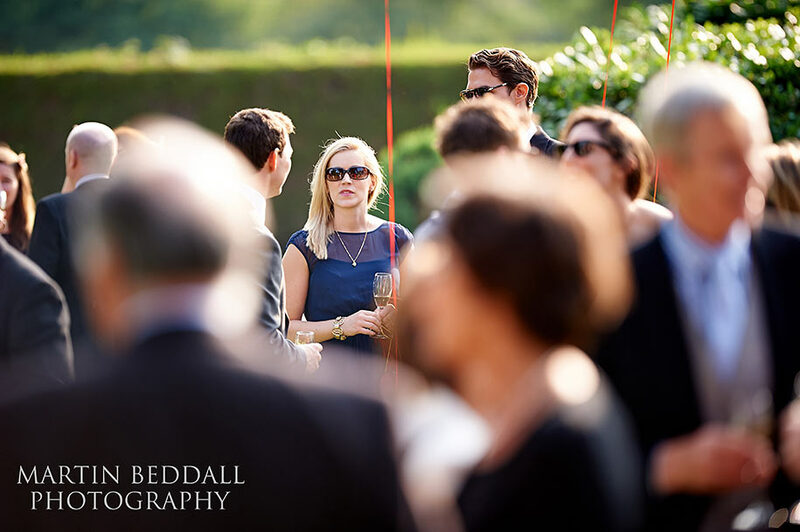 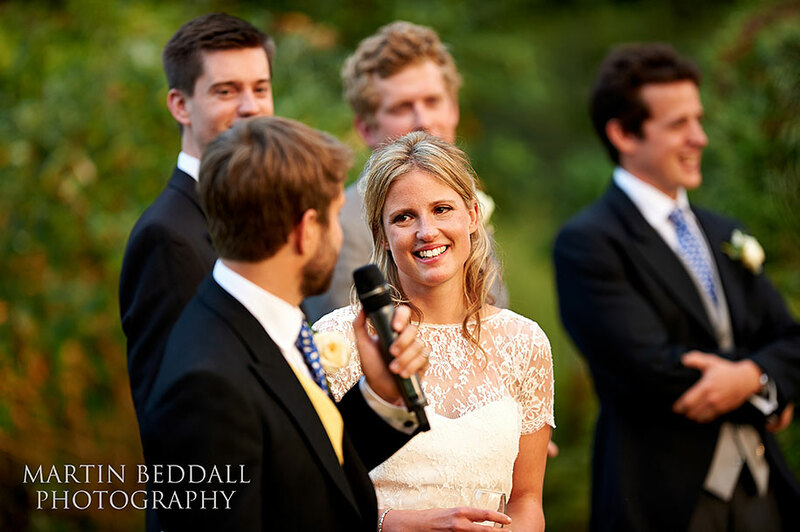 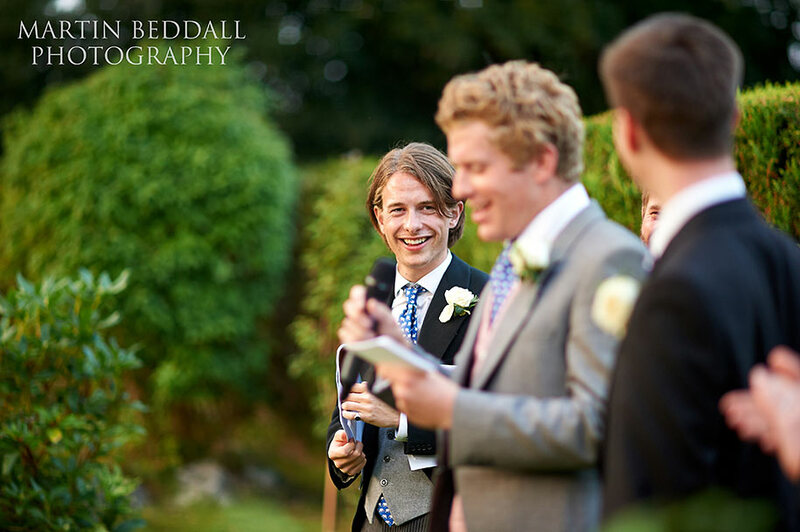 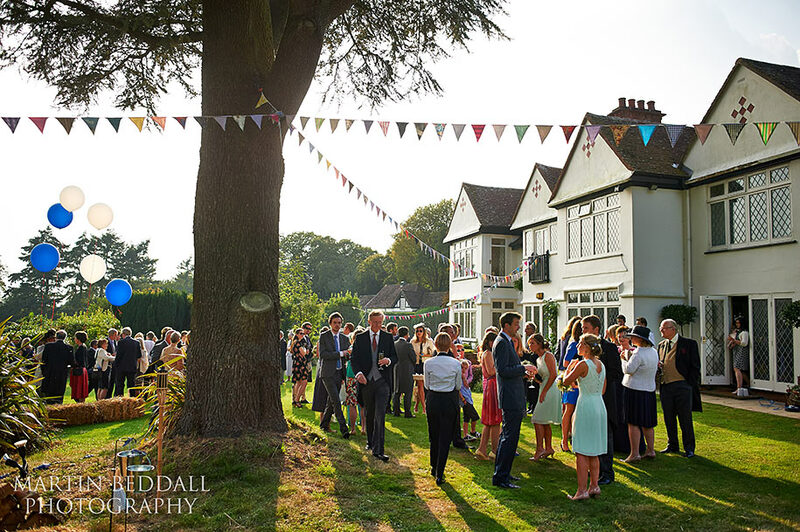 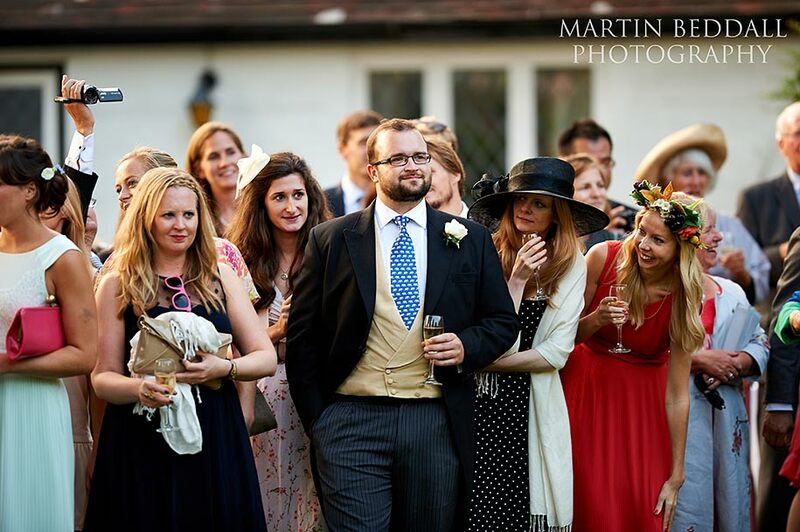 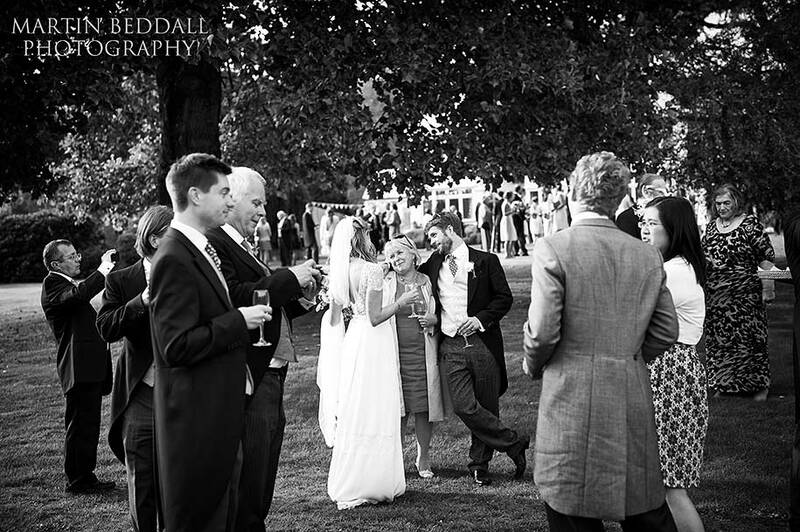 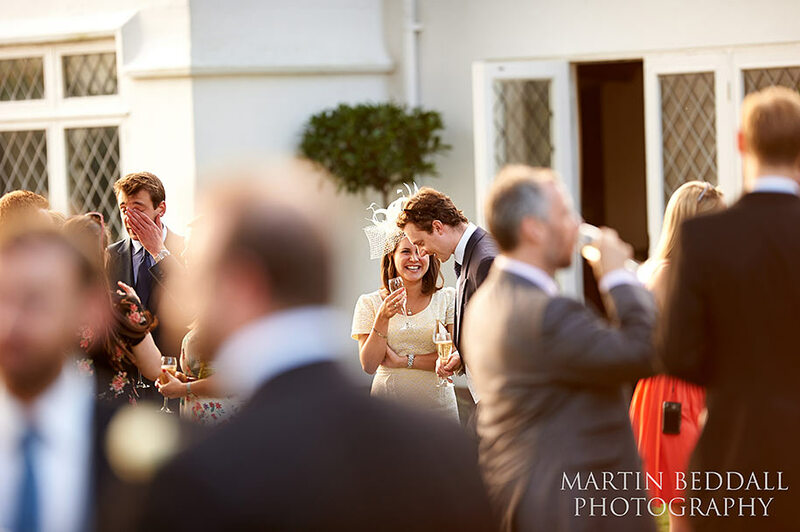 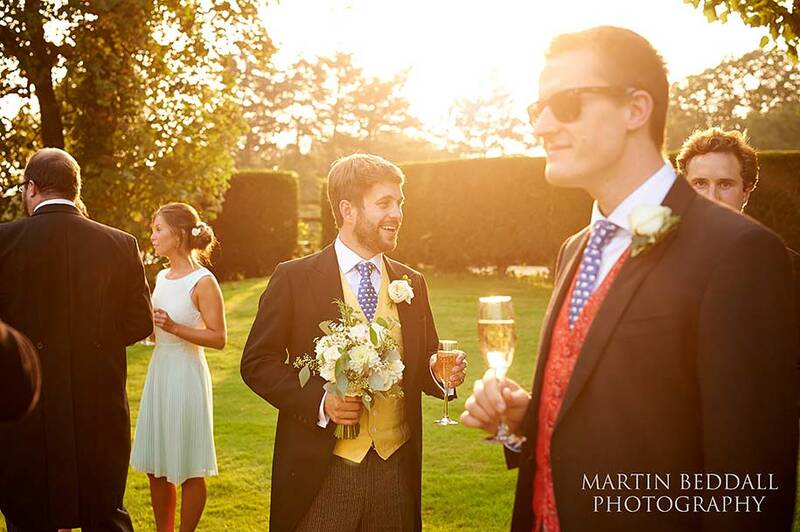 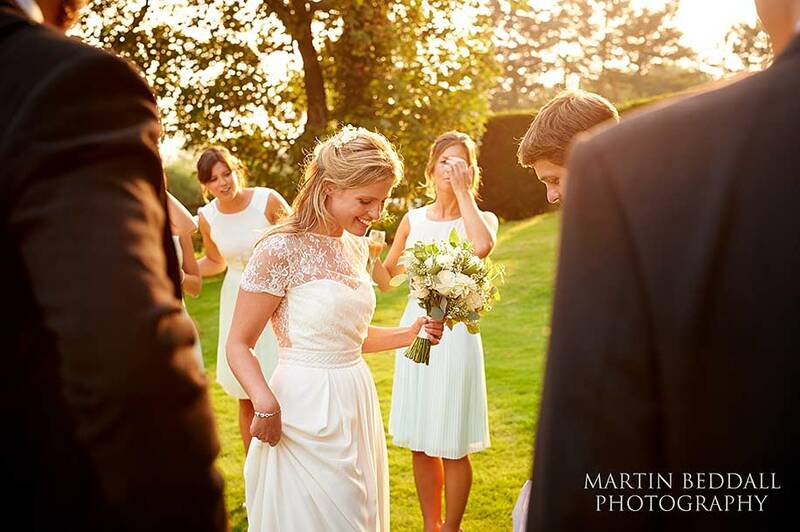 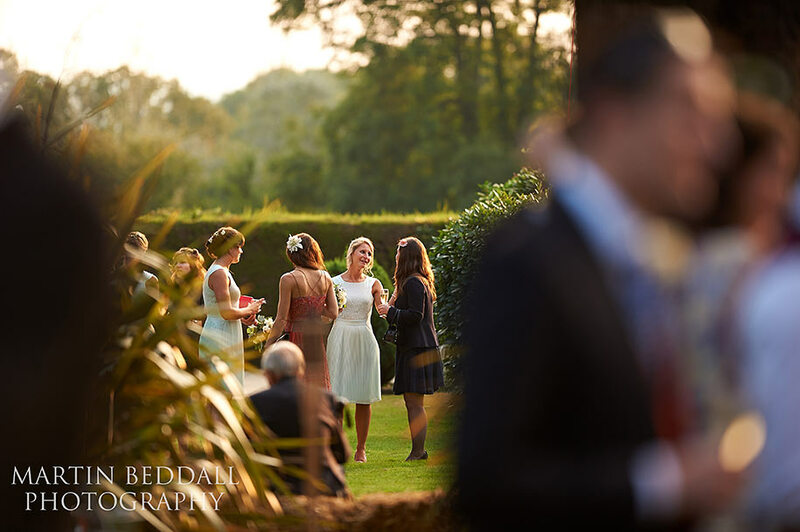 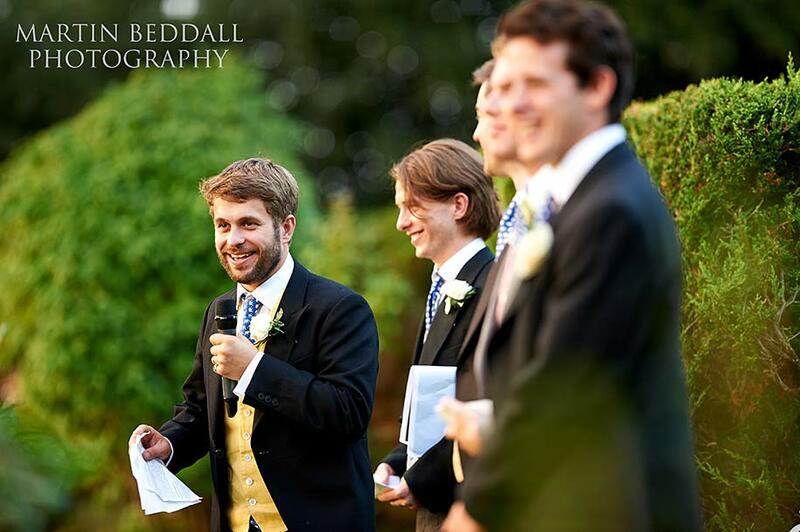 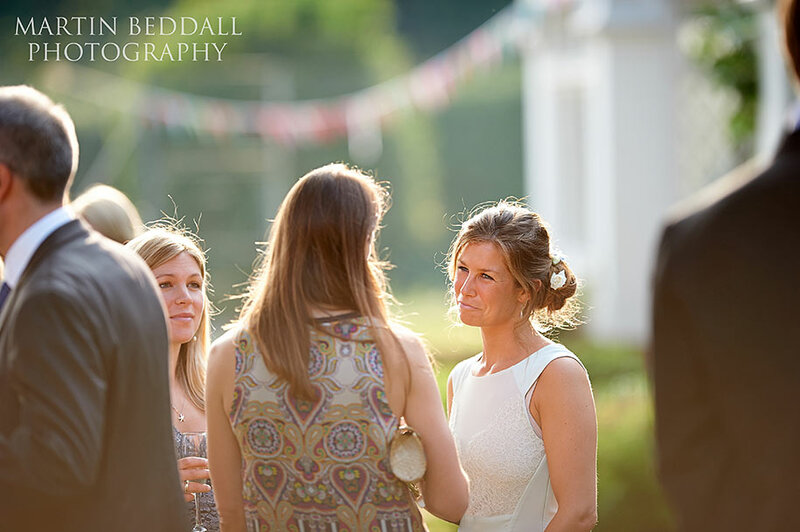 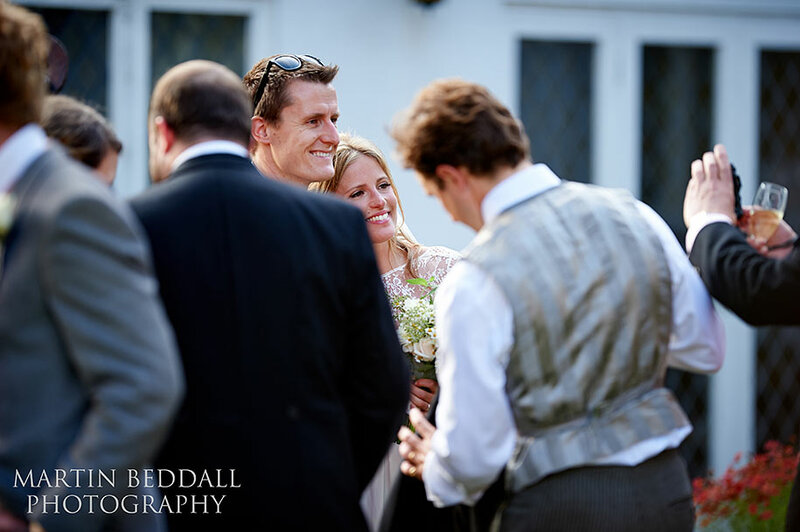 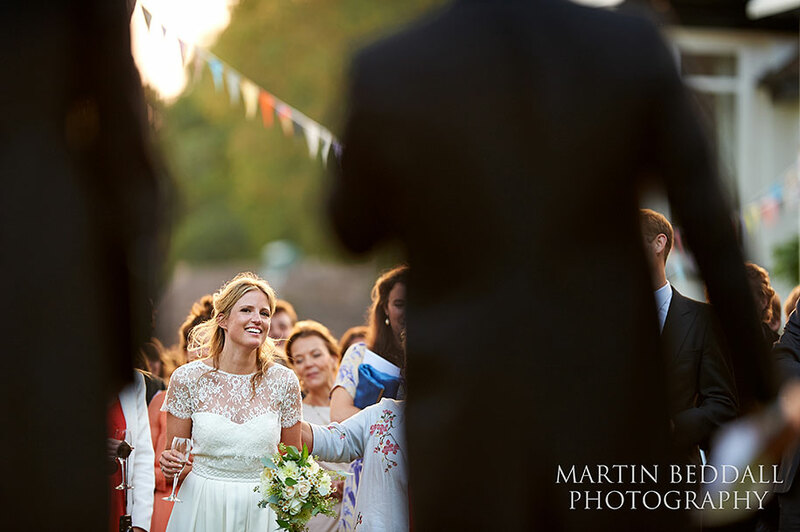 But by the time of the ceremony and certainly at the reception, the sun came out, giving that fantastic late summer evening light which was perfect for the speeches outdoors. 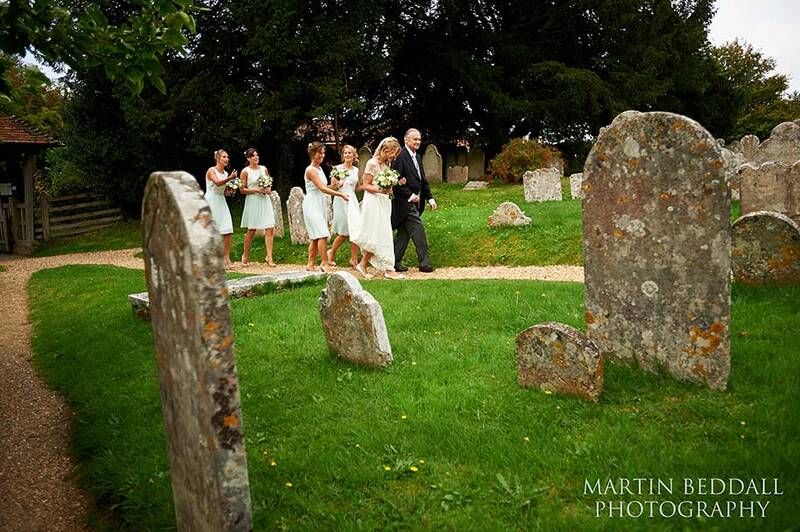 The church was a short trip back down the A31, near the turning to the Rufus Stone ( that notorious bottleneck on the way to Dorset from the M27 ) and south to the village of Minstead. 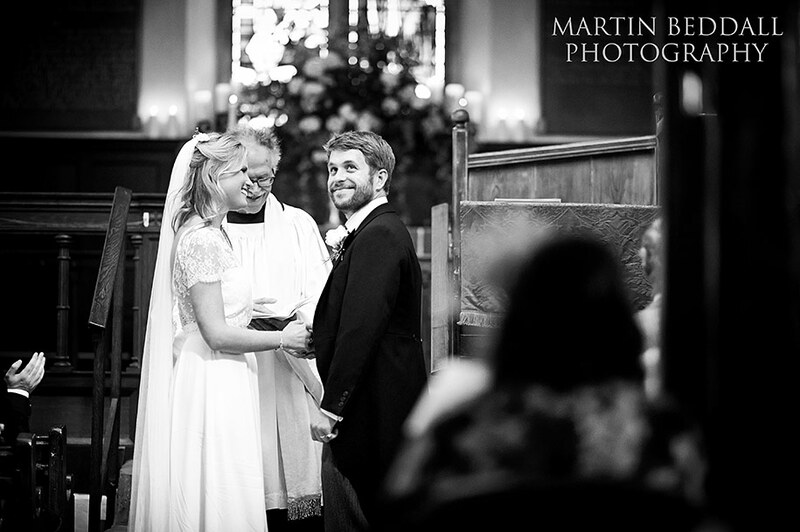 Not only did Claire have a family connection to the church, but also Robin’s uncle was the visiting vicar for the day and performed the ceremony. 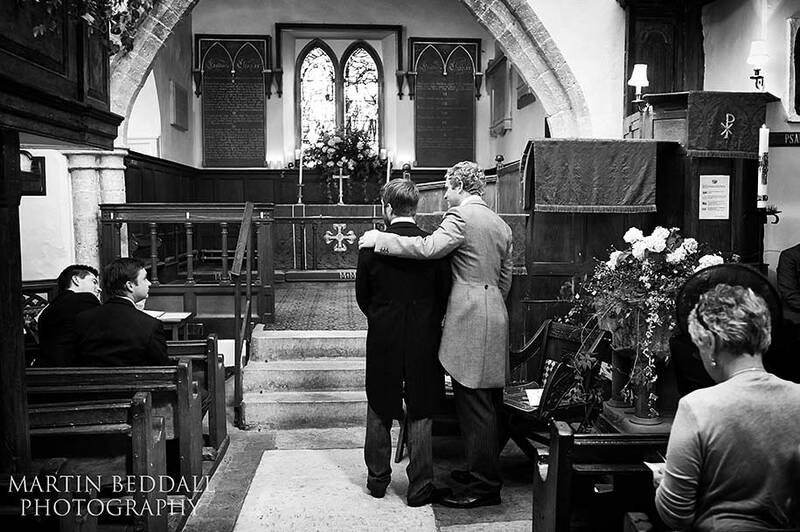 All Saints church in Minstead is an unusual little church. 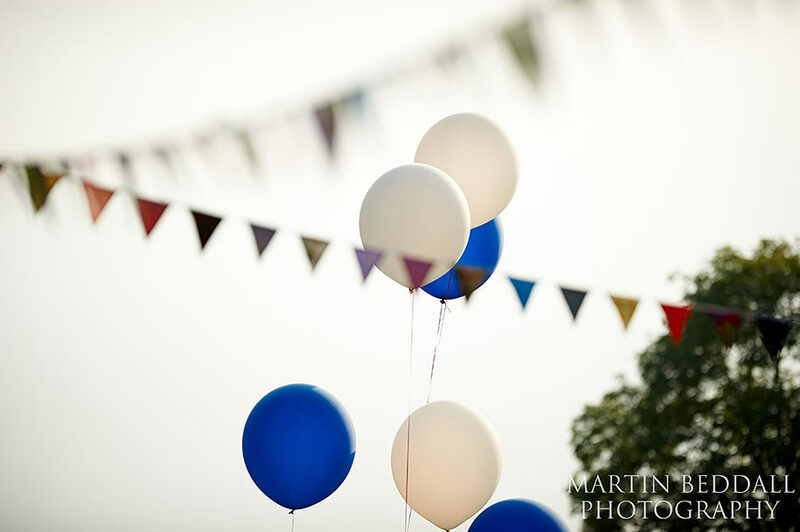 T-shaped or is it L-shaped? 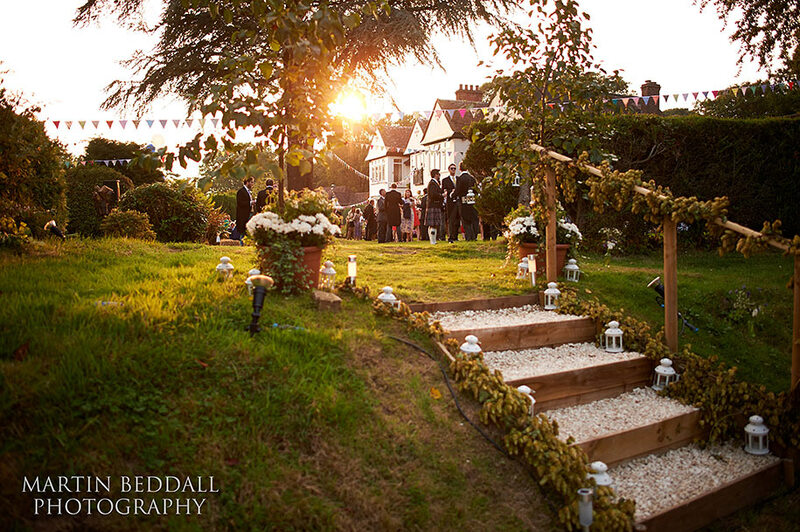 Along with an L-shaped balcony and one of the shortest aisles any bride would have to walk down. 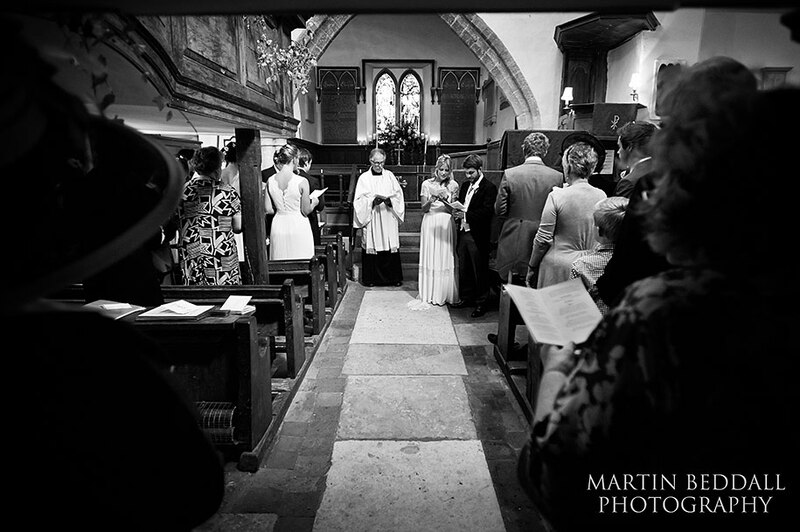 Underneath many additions over the centuries is a 12th century church and it’s an intimate space for a wedding when crammed with wedding guests. 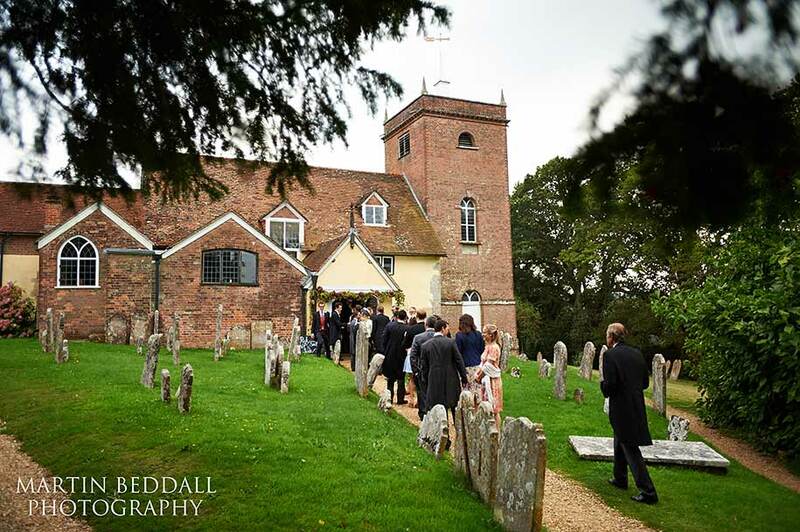 ( Sir Arthur Conan Doyle is buried in the churchyard ) You know you are in the New Forest when you encounter a cow blocking the road into the village as you enter and then a horse in the same spot when you leave. 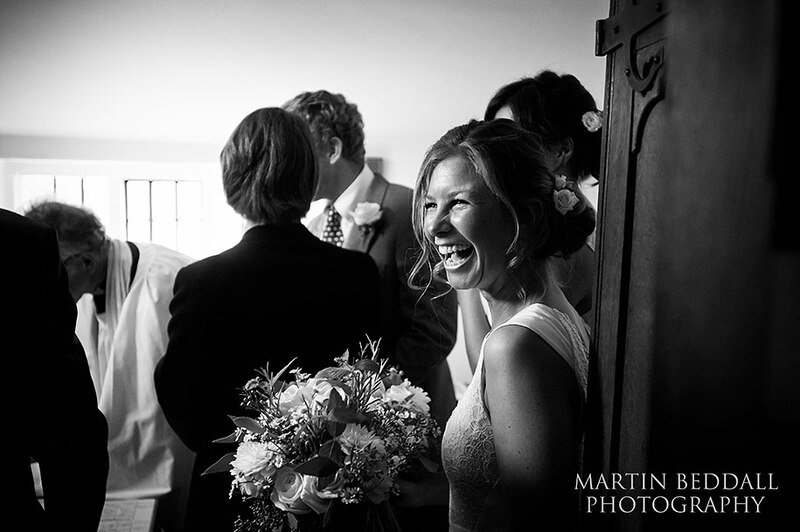 Ceremony completed, Claire and Robin exited the church and immediately walked around to the back and an open side door. 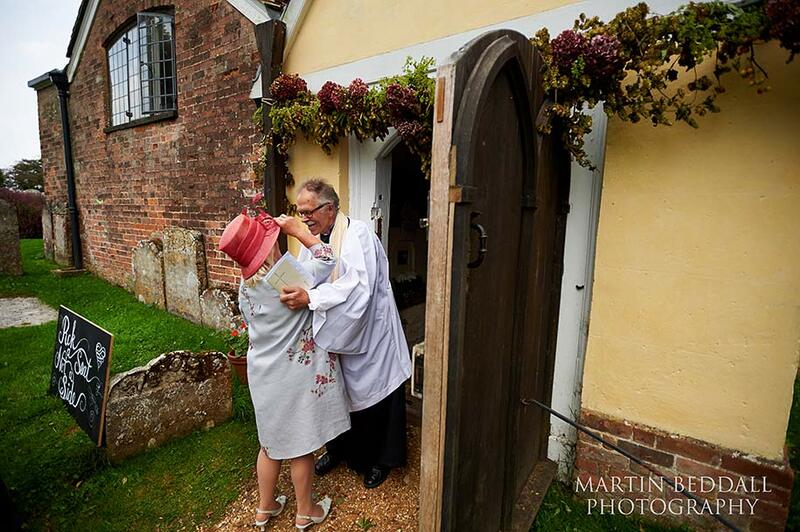 It’s great when a couple can do this. 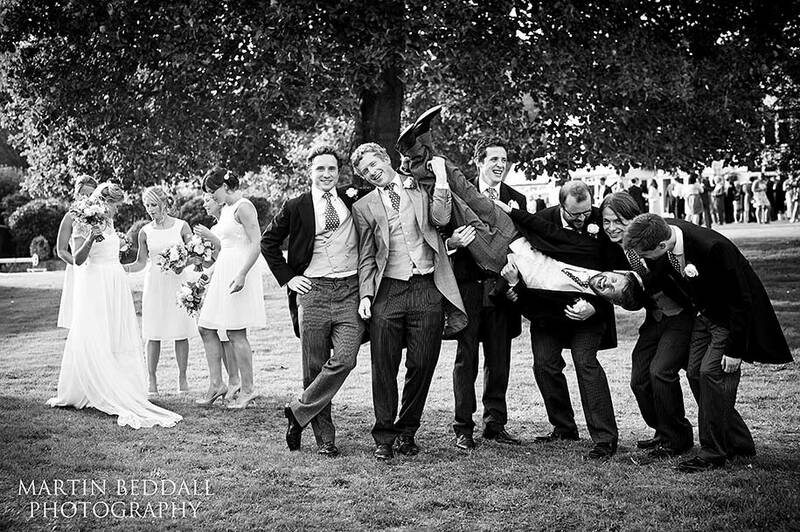 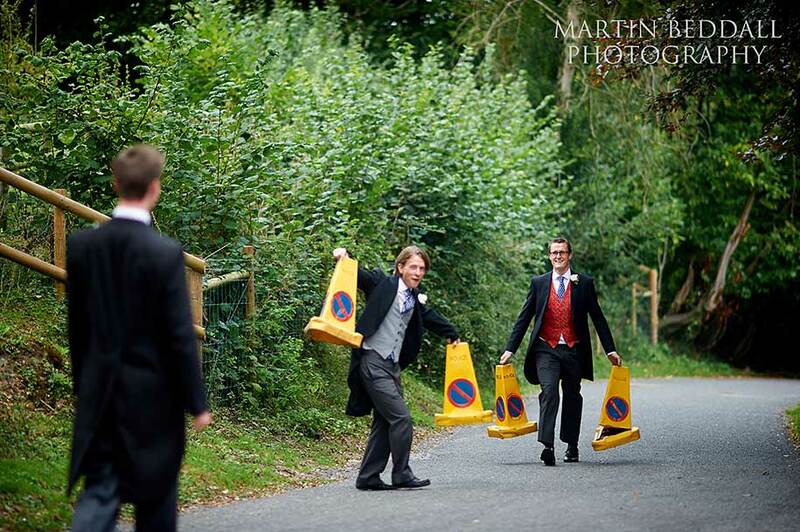 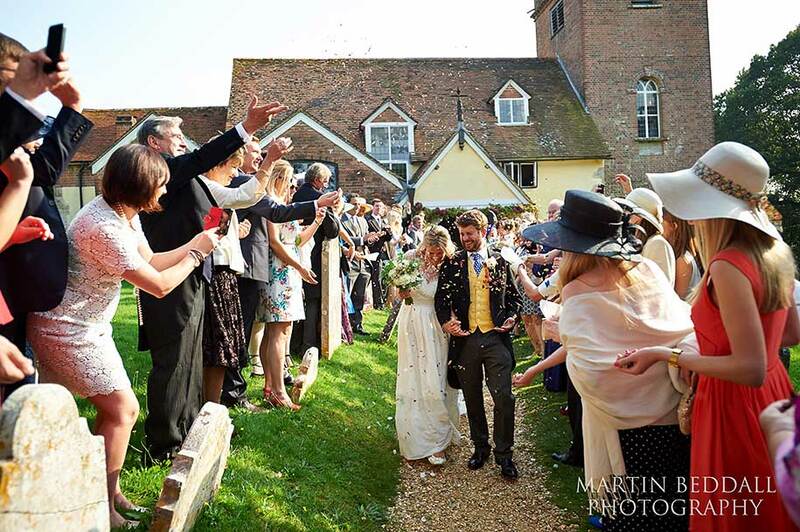 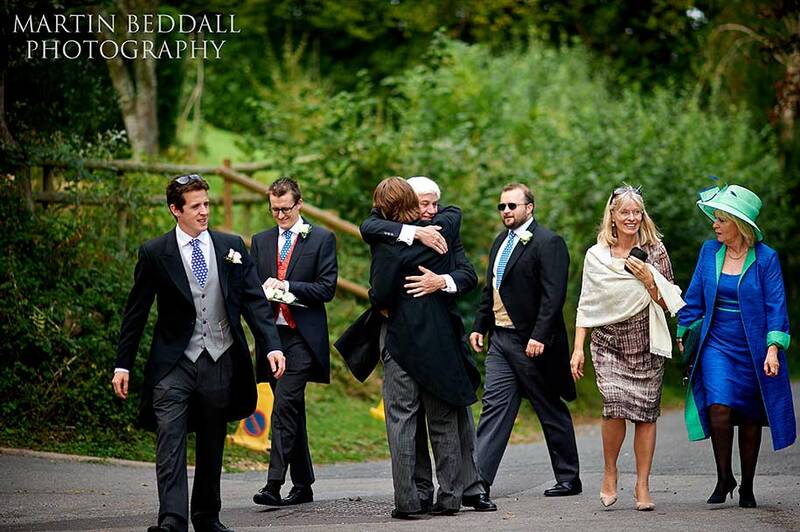 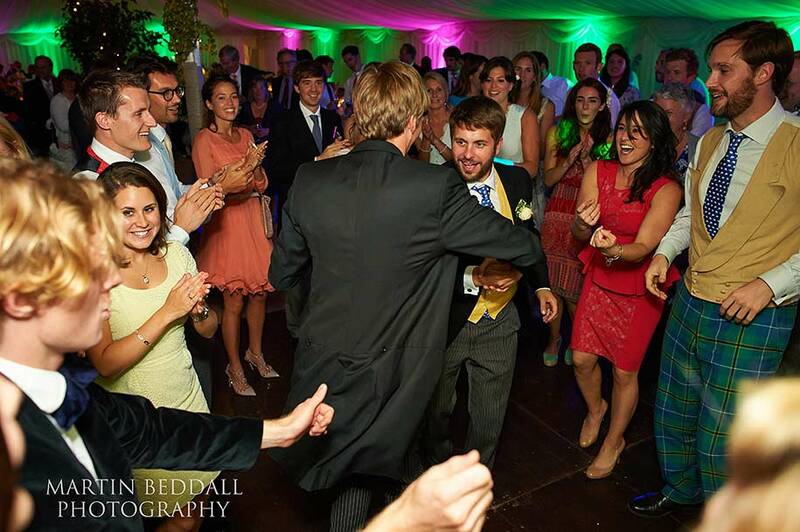 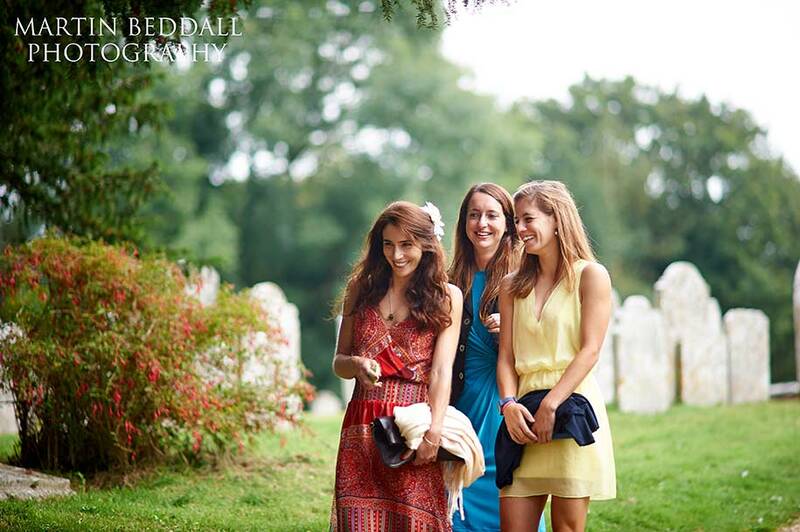 It lets the guests get out of the church and form a formidable avenue, clutching confetti. 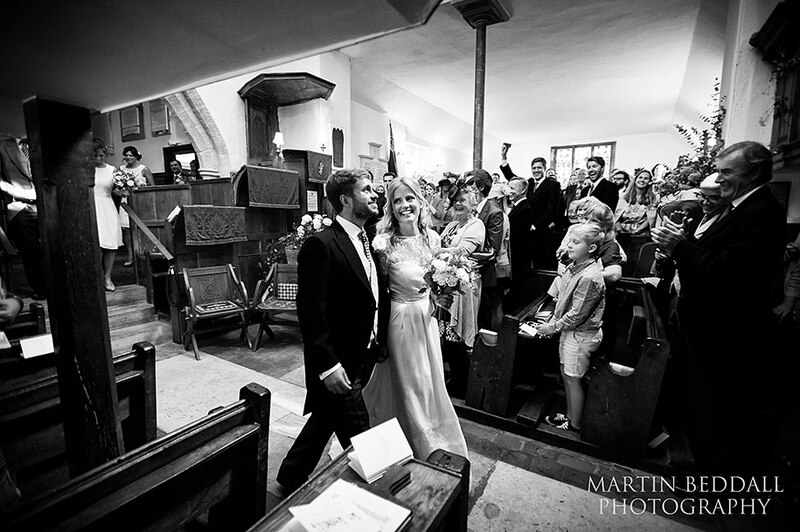 The couple can then emerge once again from the church for the bombardment. 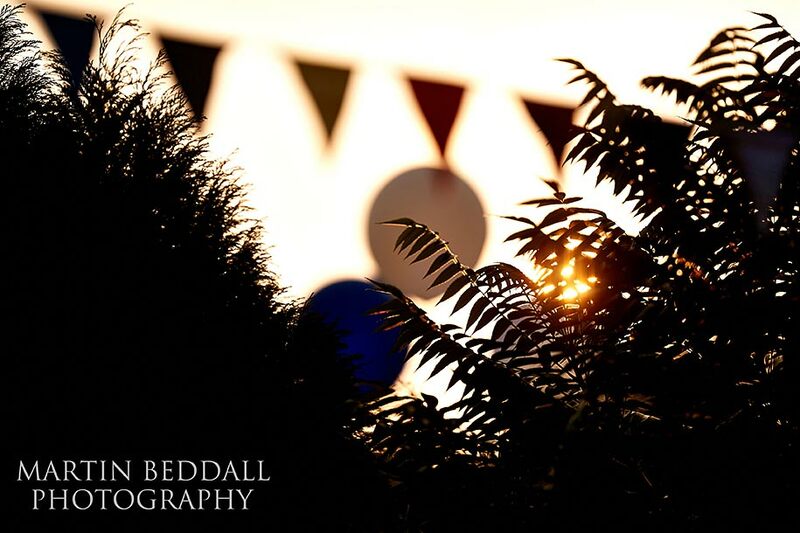 Back at the house, a deer watched from across the lake, as the reception was bathed in golden sunlight. 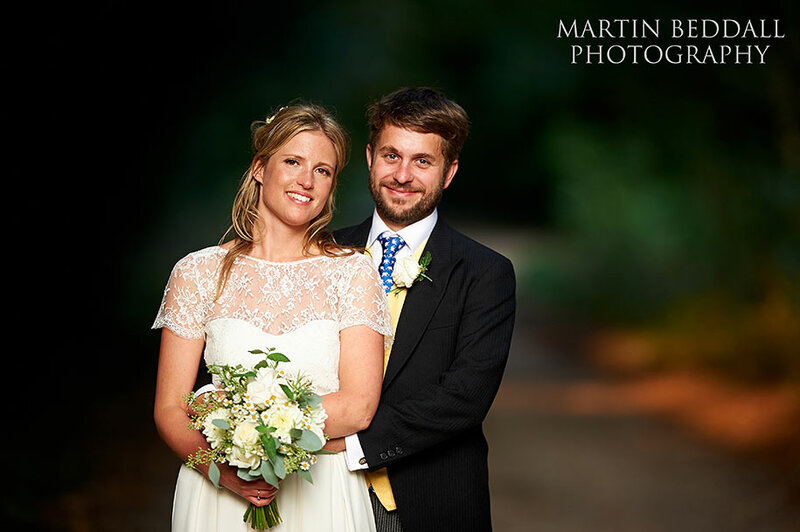 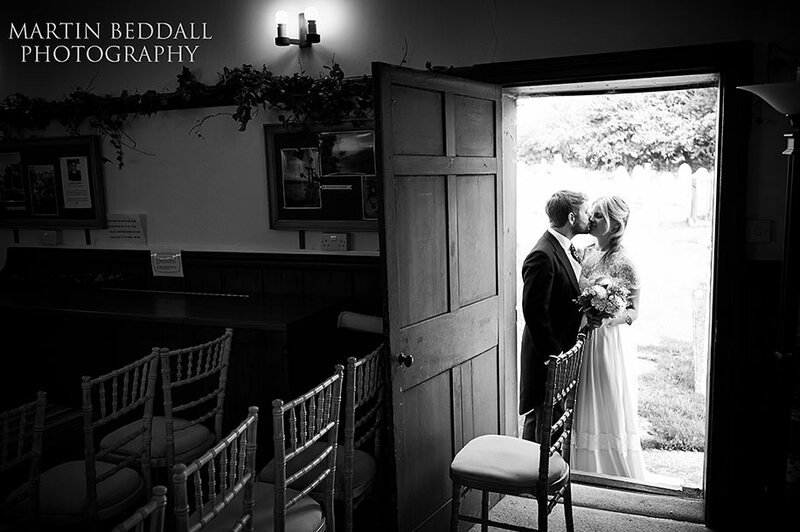 ( Robin was even persuaded by his bride to have some pictures taken as this light lasted! 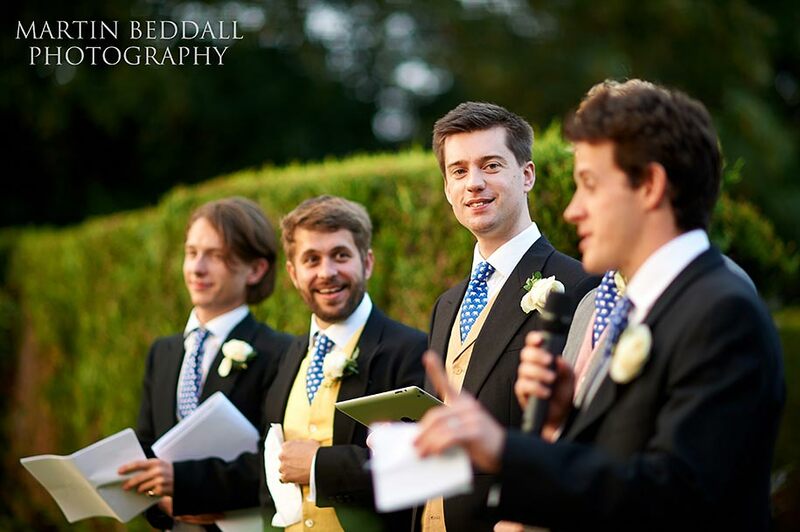 😉 ) It was then time for speeches, outdoors. 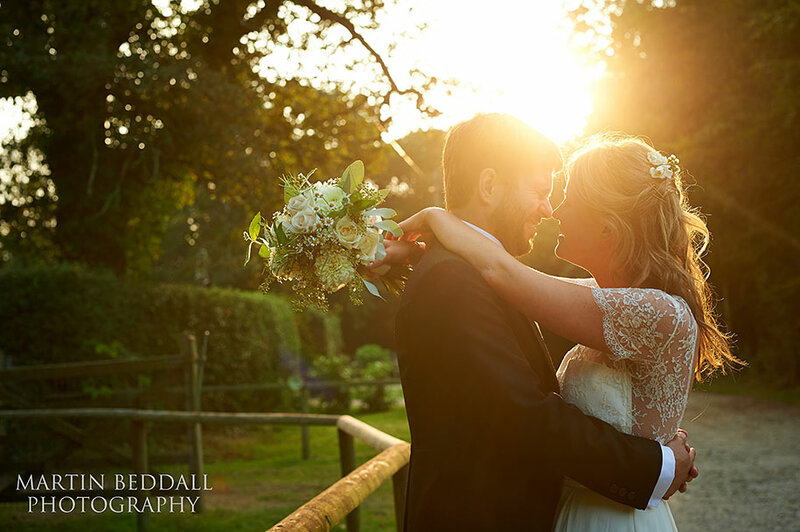 The light was perfect for this, soft and just about to drop away completely. 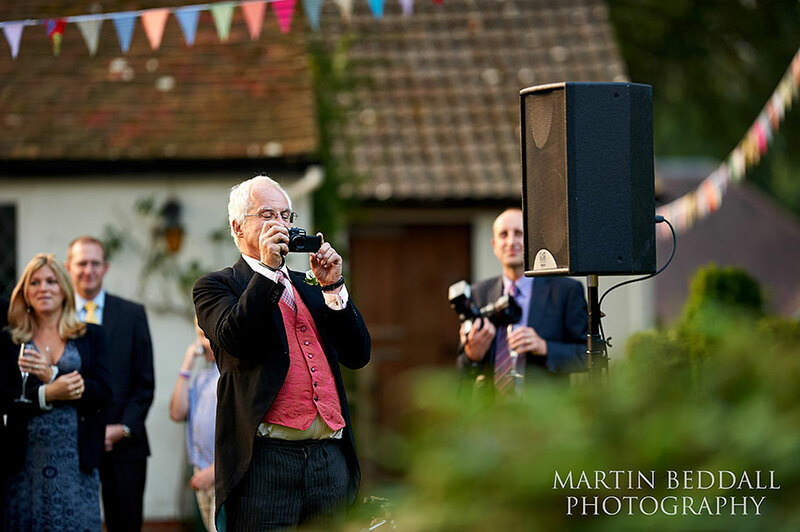 As a photographer, if the space and light is right, speeches outdoors are so much better than in a marquee or hotel dining room. 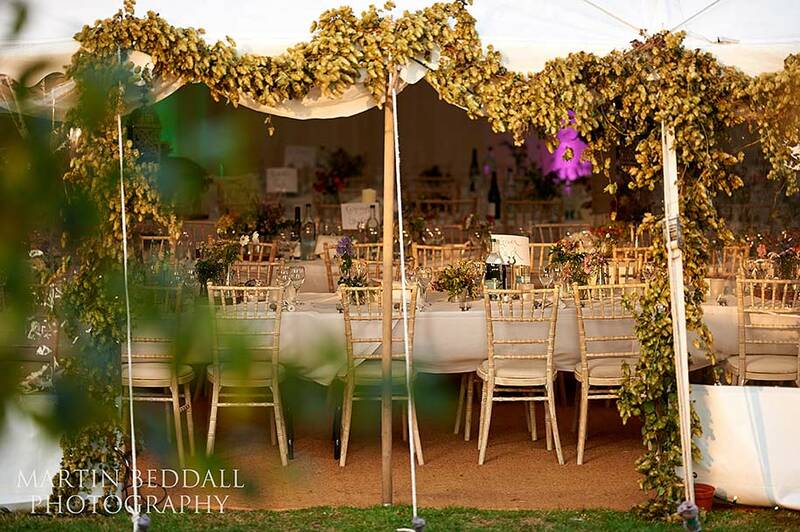 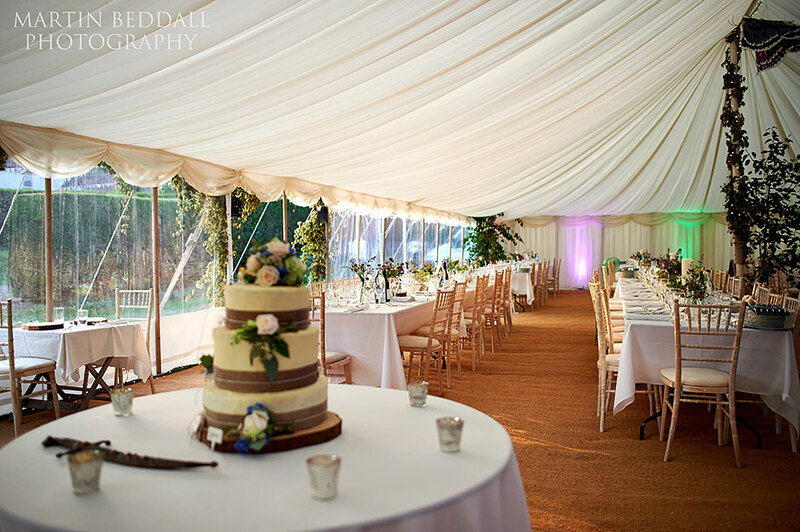 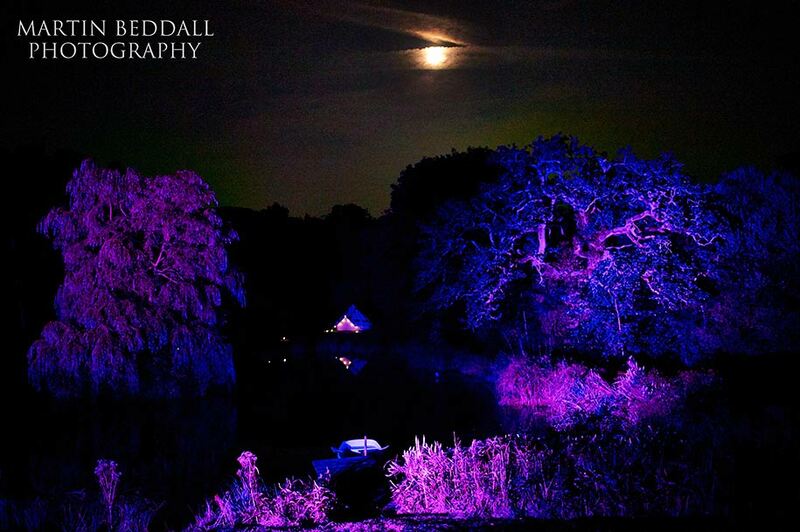 Not long after everyone was in the marquee the light disappeared – the nights are drawing in now. 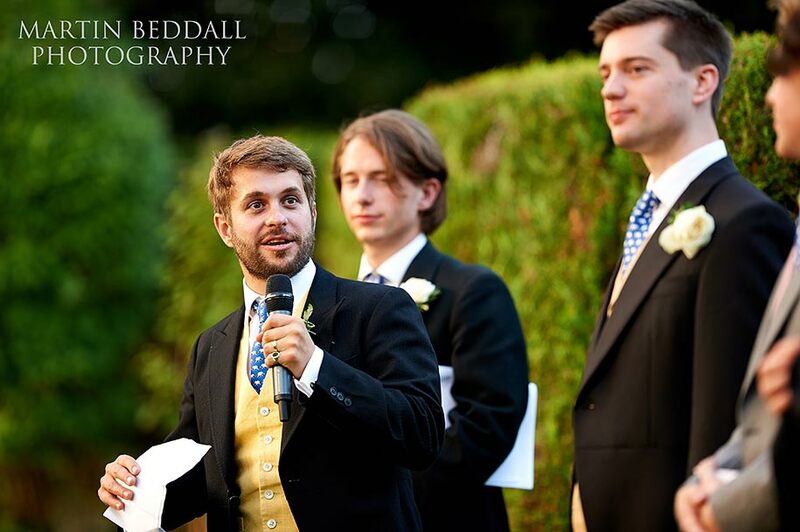 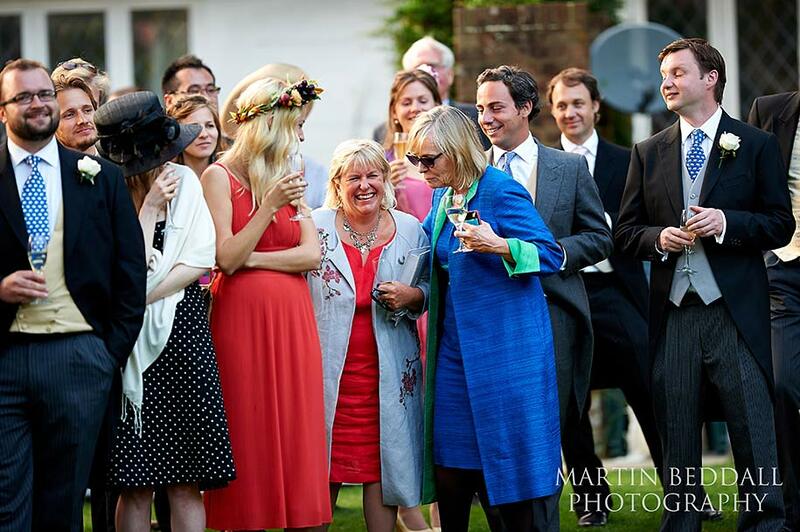 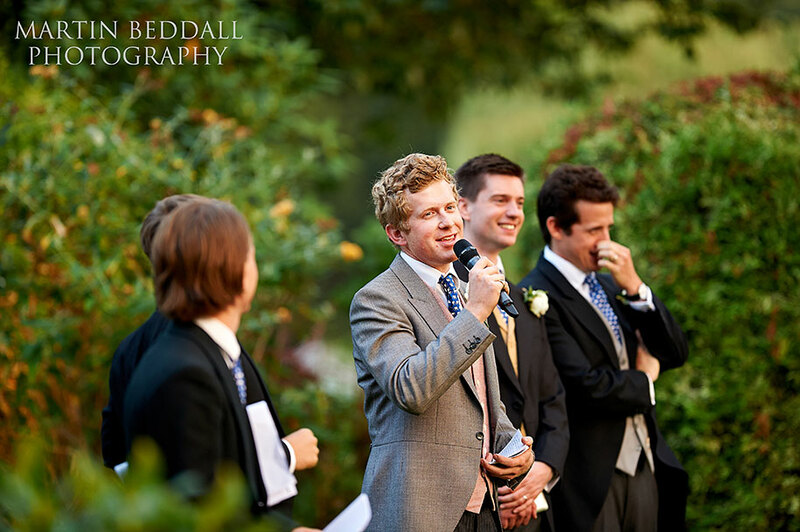 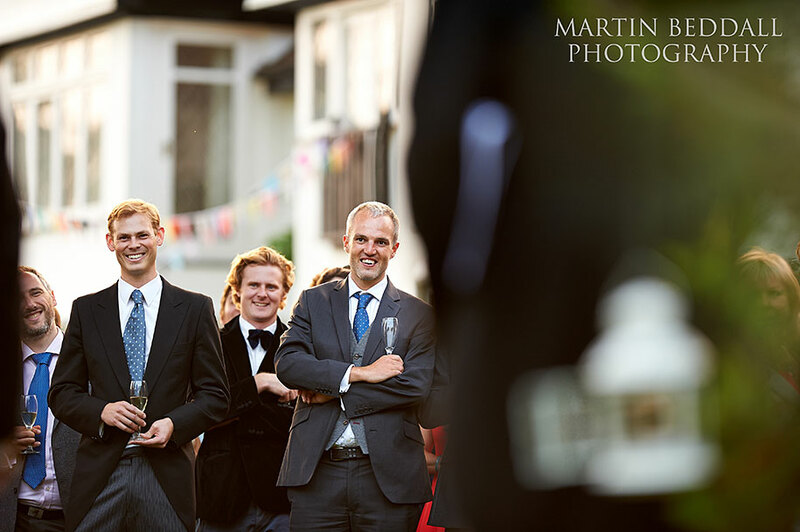 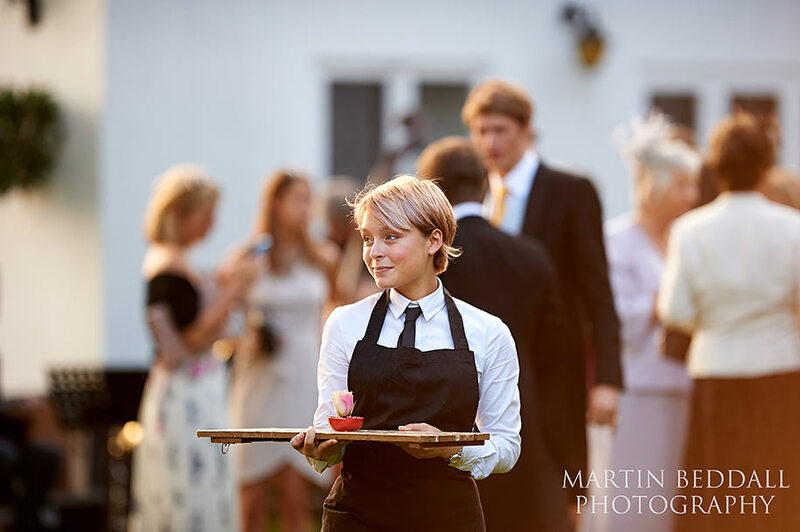 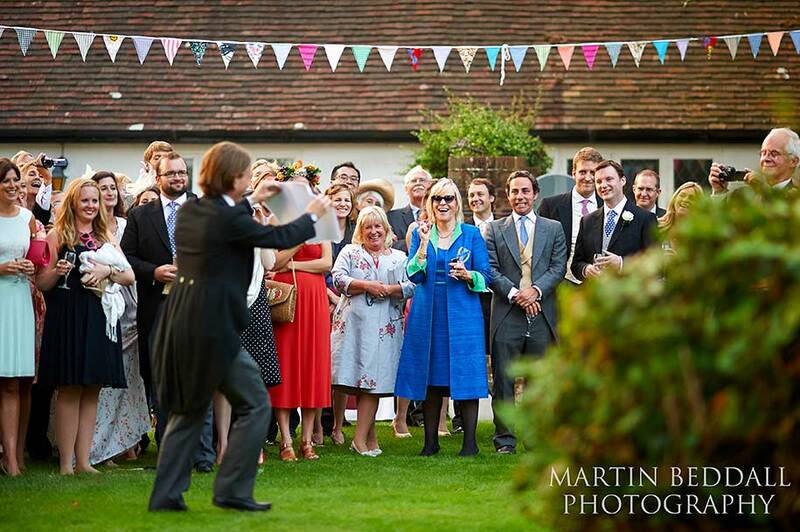 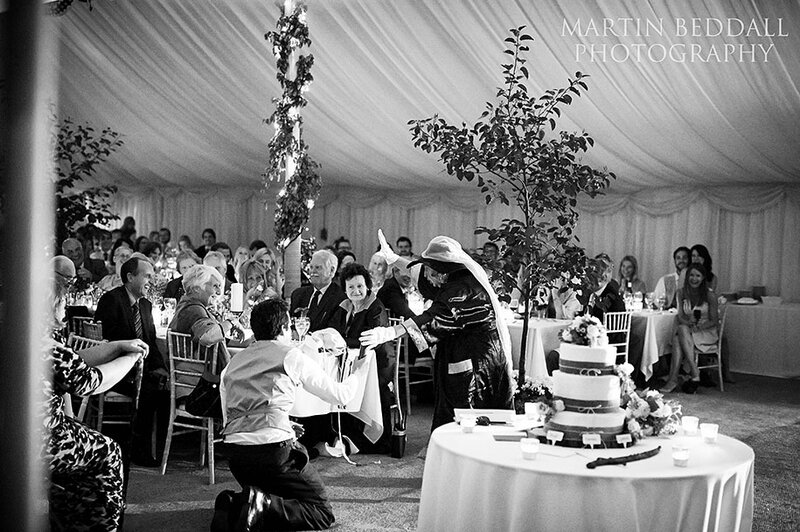 Before cake cutting and the dancing ( with marshmallow toasting next to the braziers outside as an alternative ) there was a short, quirky monologue by a family friend – check out the ‘angel’ shot. 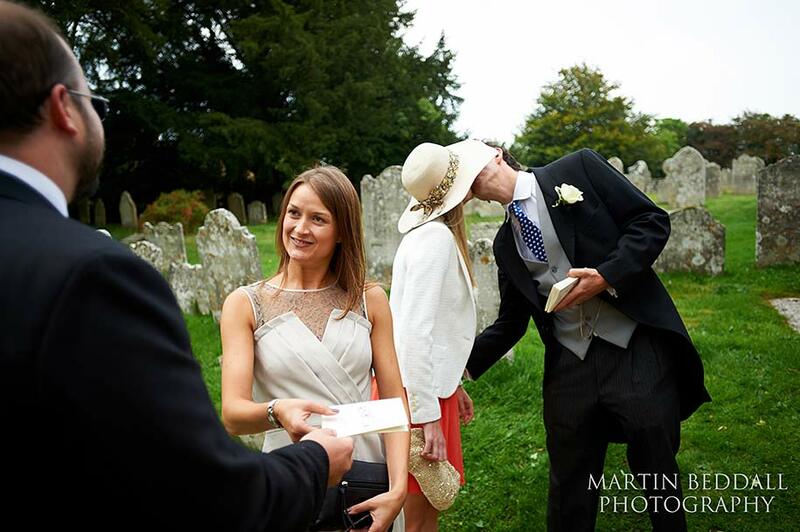 A spooky play.